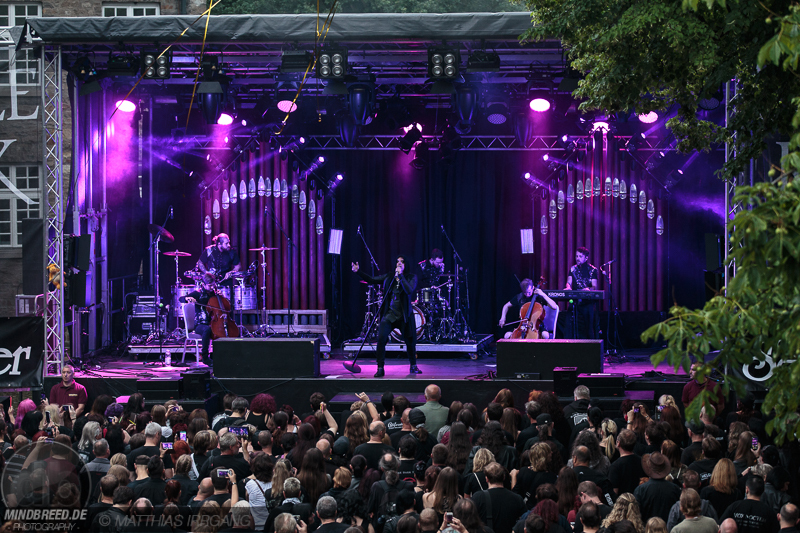 The Castle Rock Festival 2017 at Castle Broich in Mülheim is over. 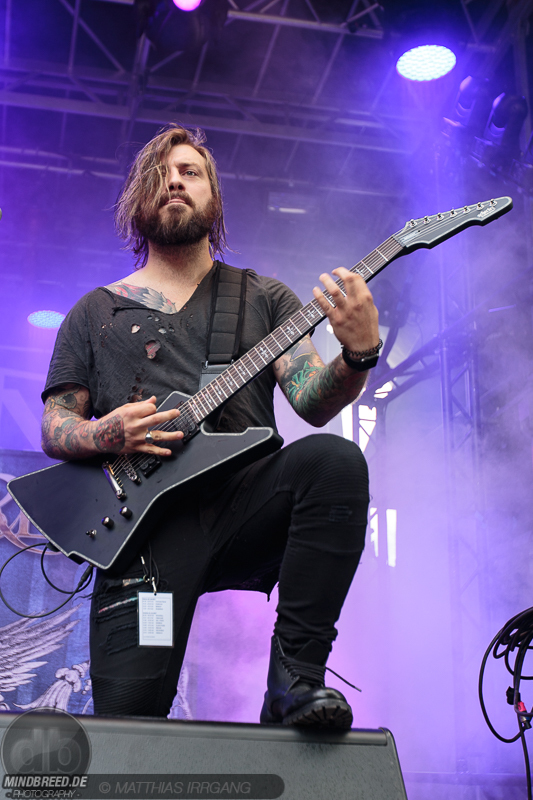 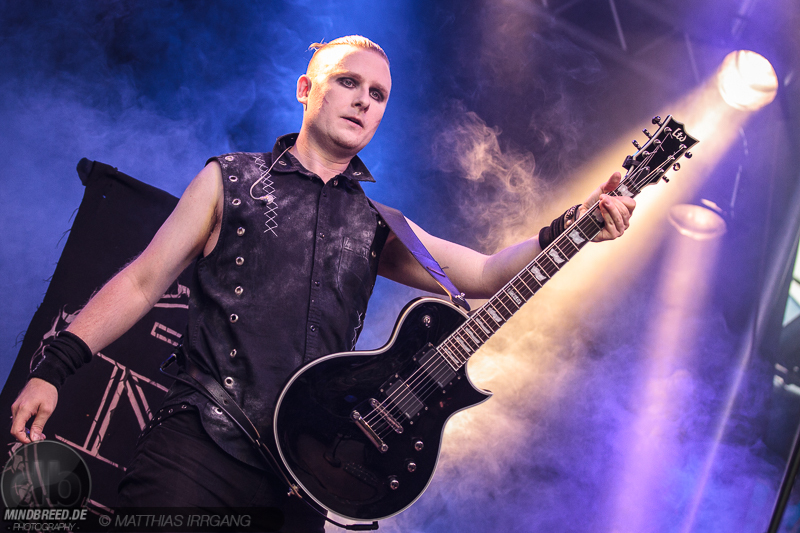 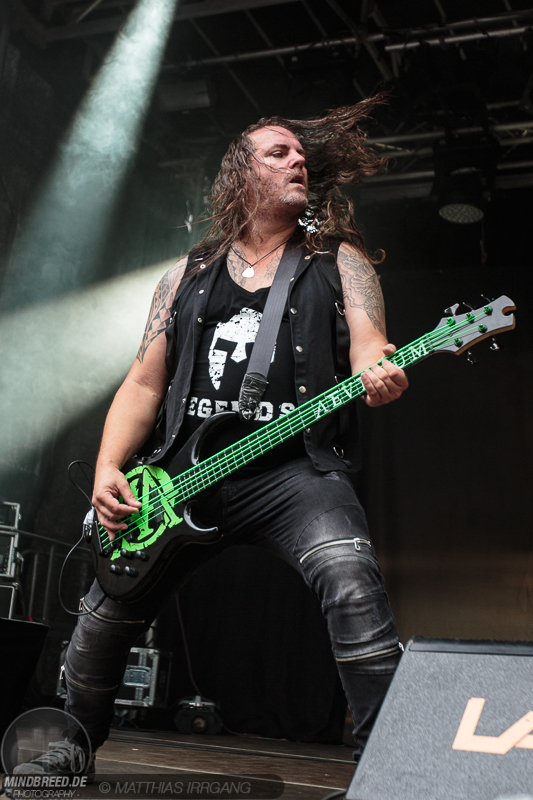 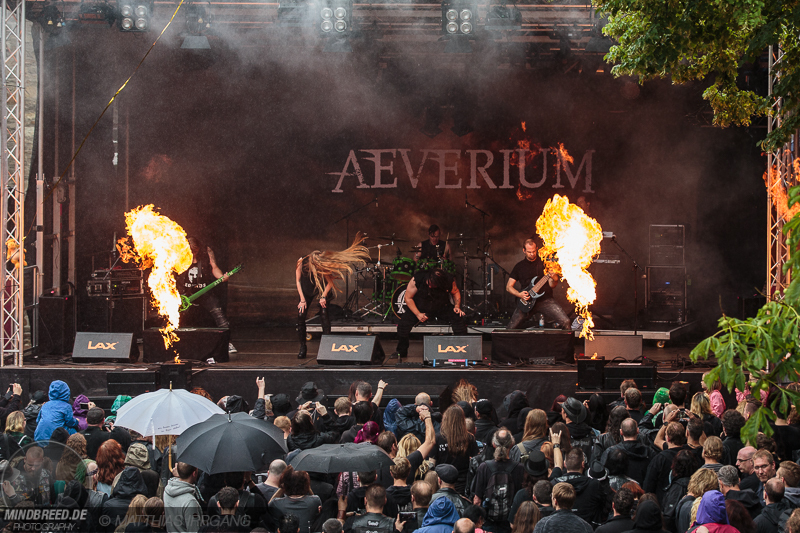 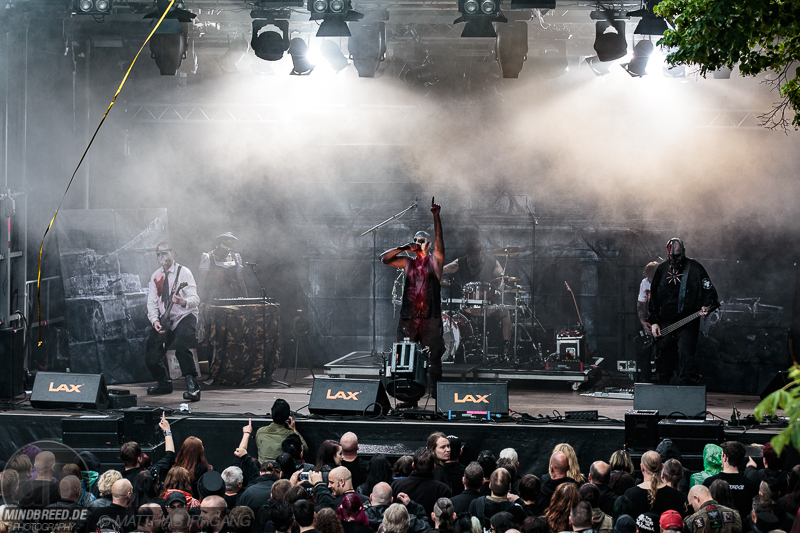 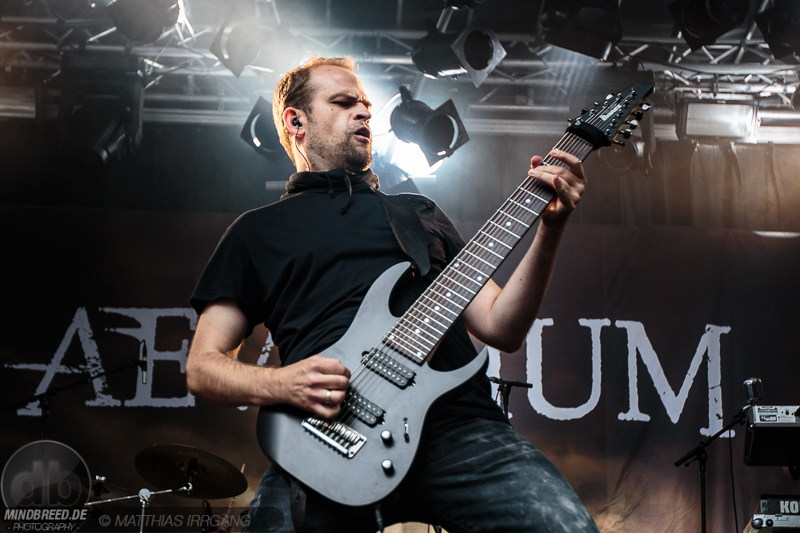 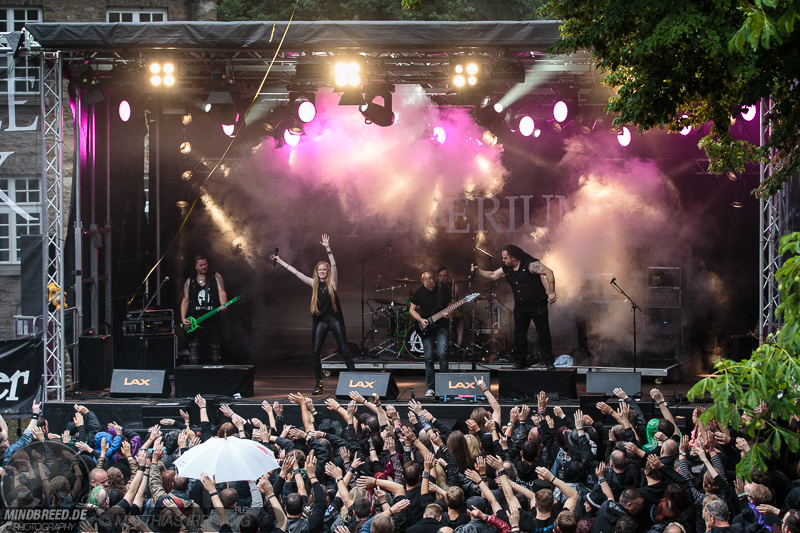 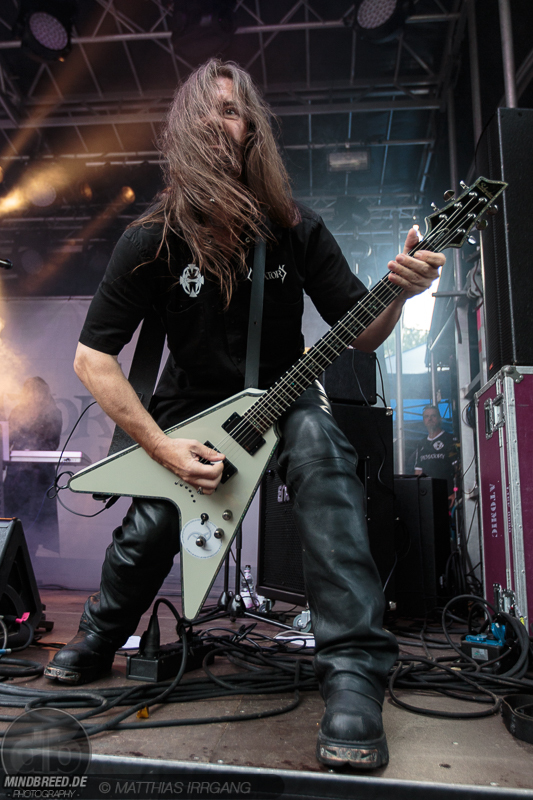 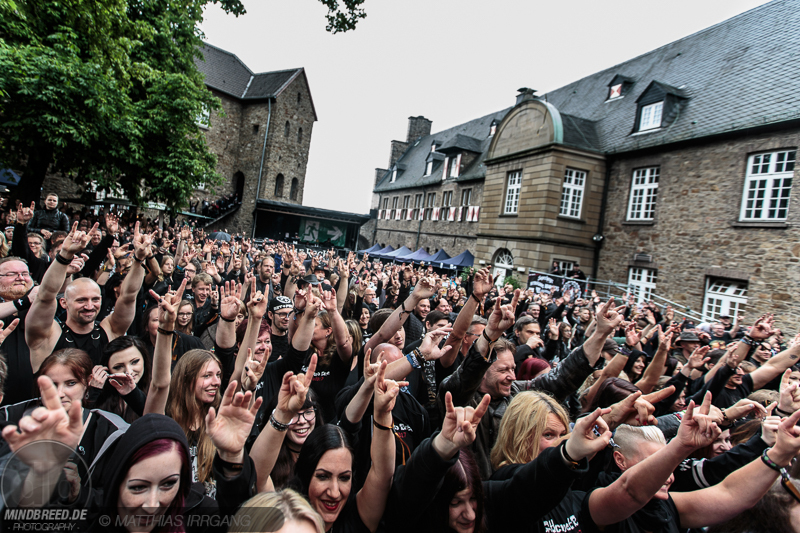 On June 30 and July 1, the black fan community gathered to celebrate bands like AEVERIUM, CREMATORY, THE DARK TENOR, MOONSPELL, OST + FRONT, or VLAD IN TEARS. 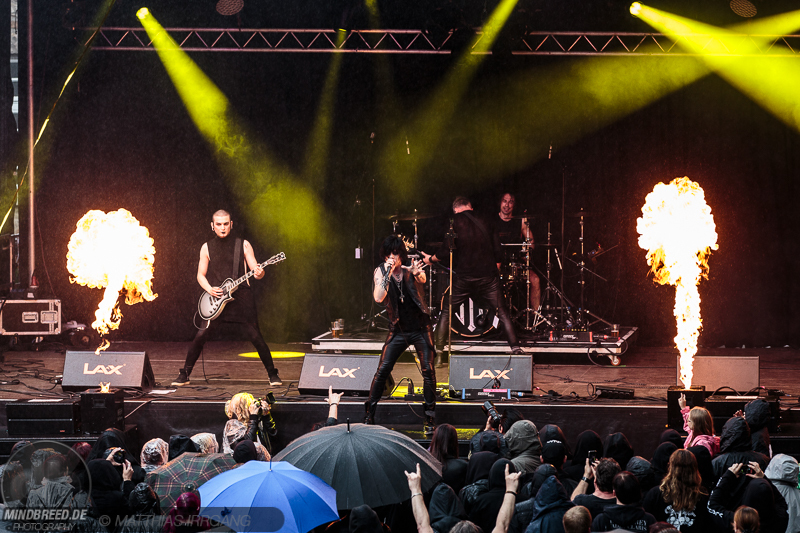 The fact that the weather was not at its best this weekend was negligible considering all the hot shows. 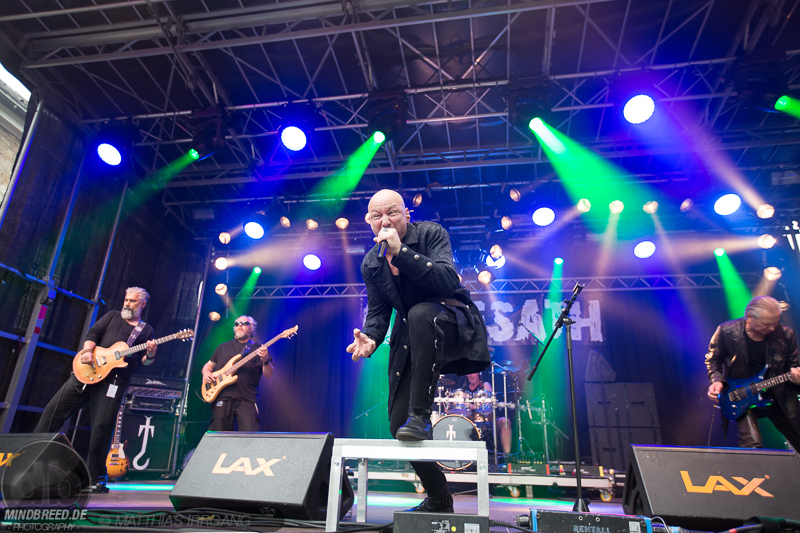 As always, Friday is the first day of the Castle Rock Festival, so the start of the 2017 line-up was launched in the early evening. 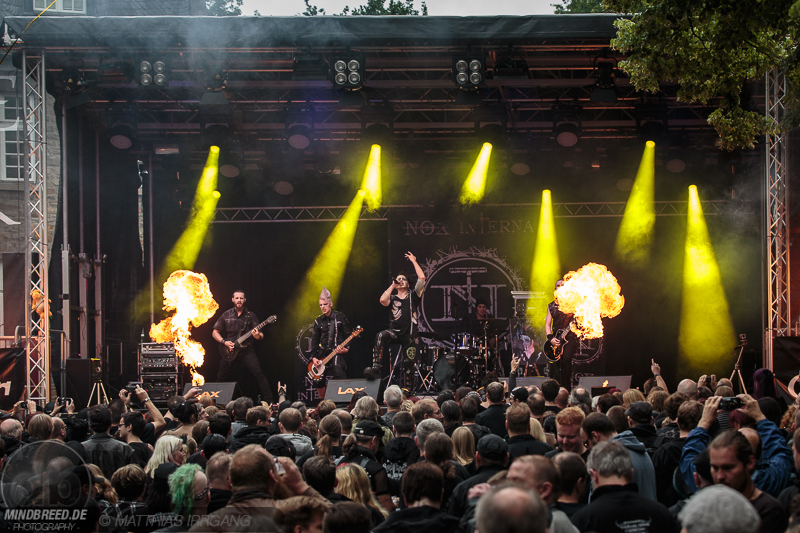 This year, MAERZFELD opened the festival at Castle Broich. 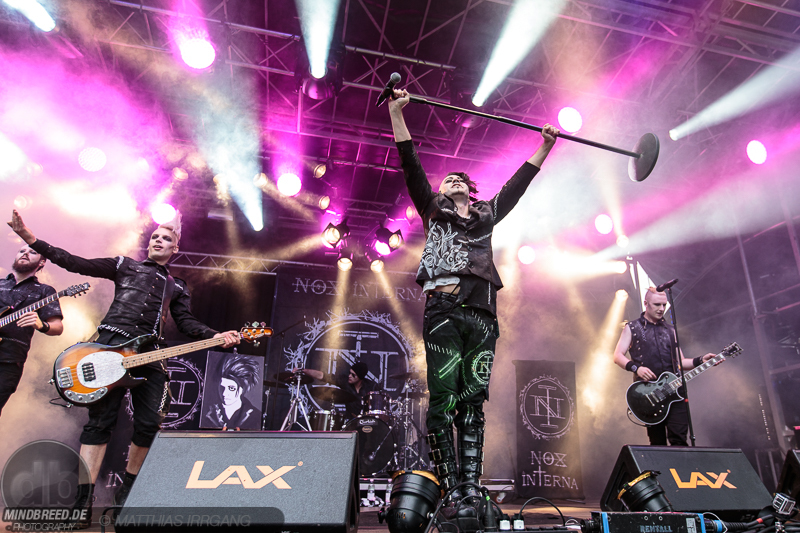 For those who do not know the band, they directly pick up hard sounds on one hand-side, the rest was able to go full speed with NDH sounds in the style of RAMMSTEIN. 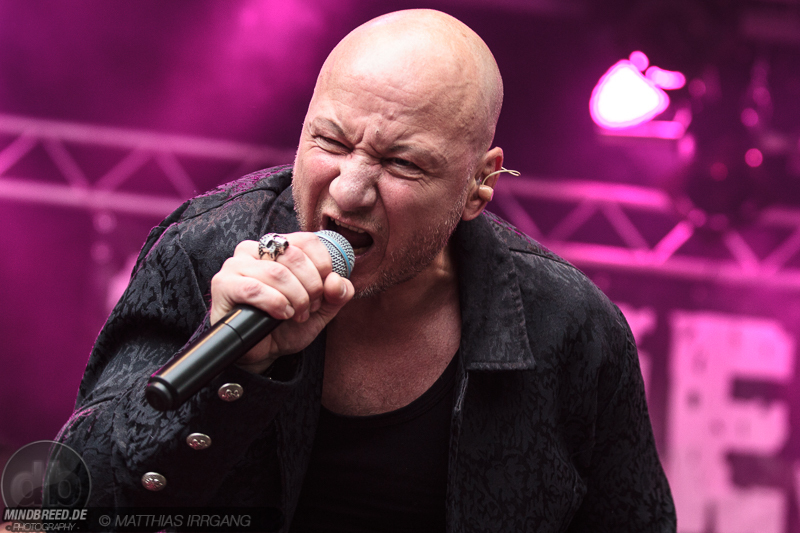 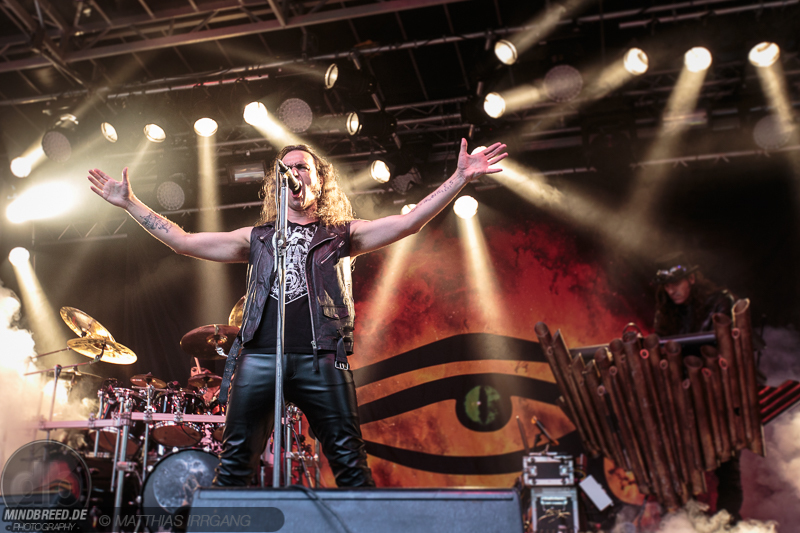 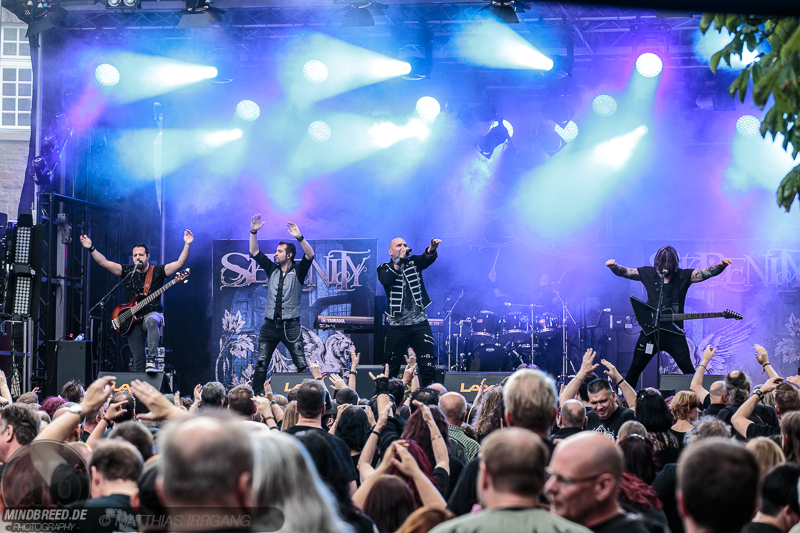 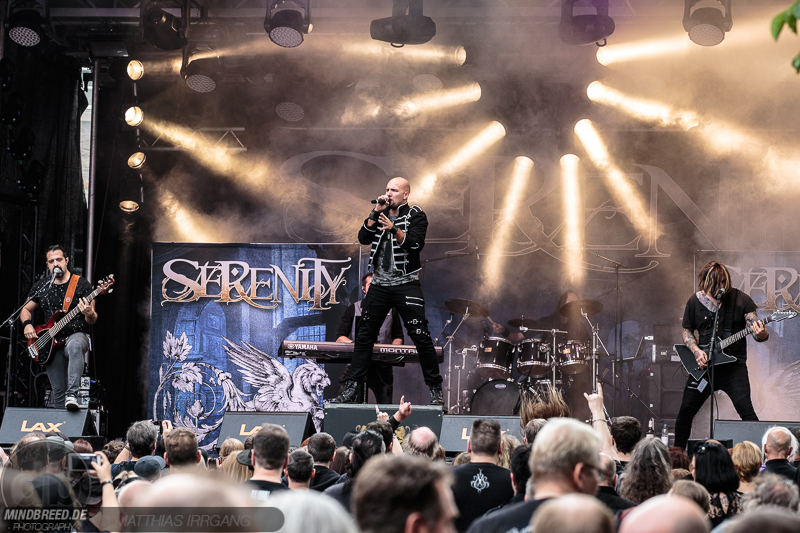 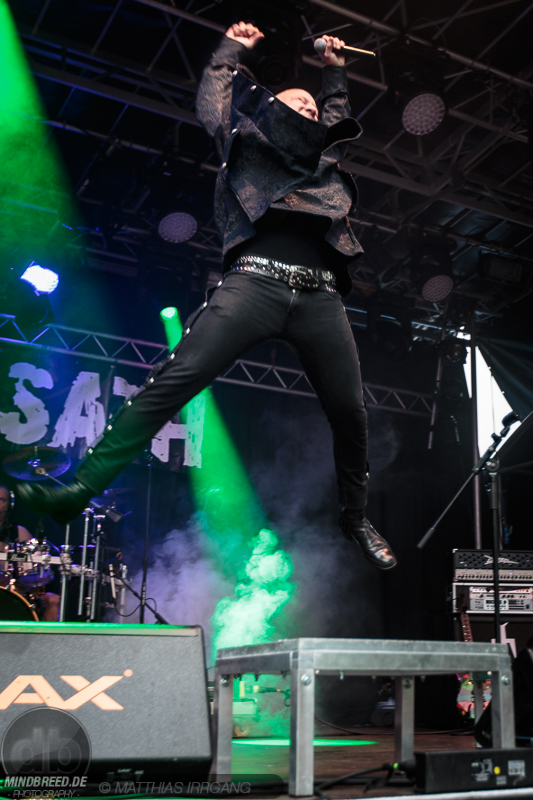 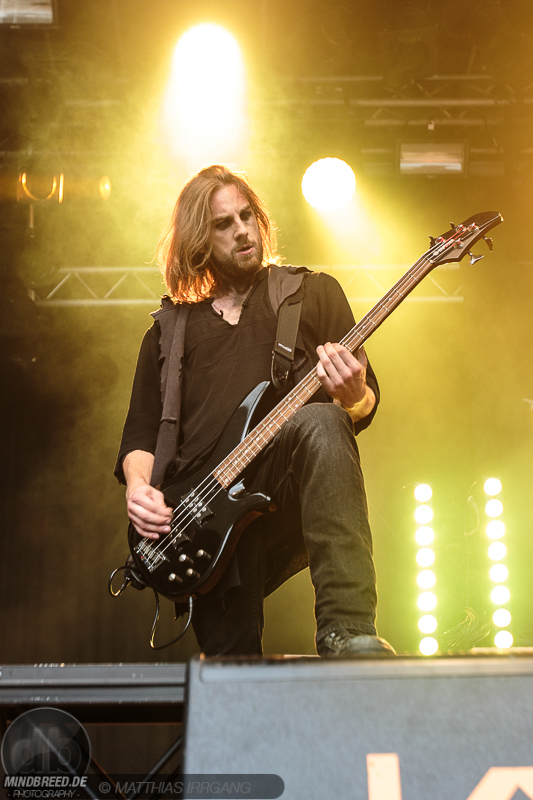 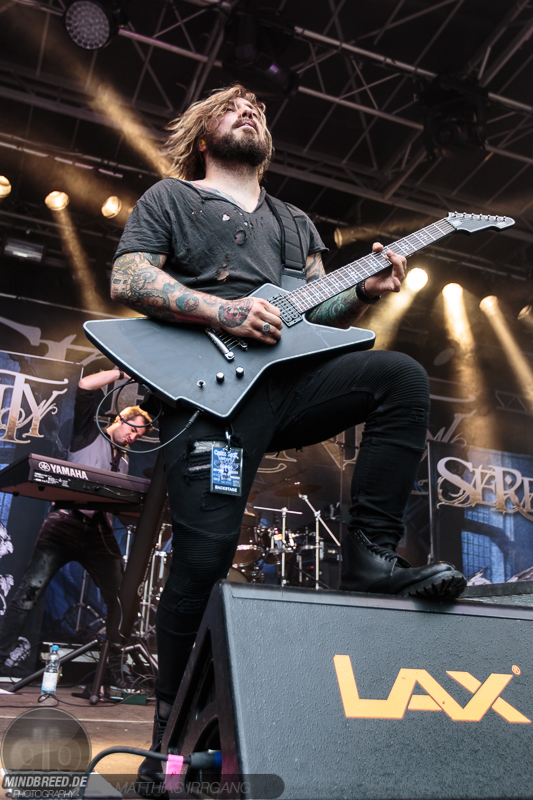 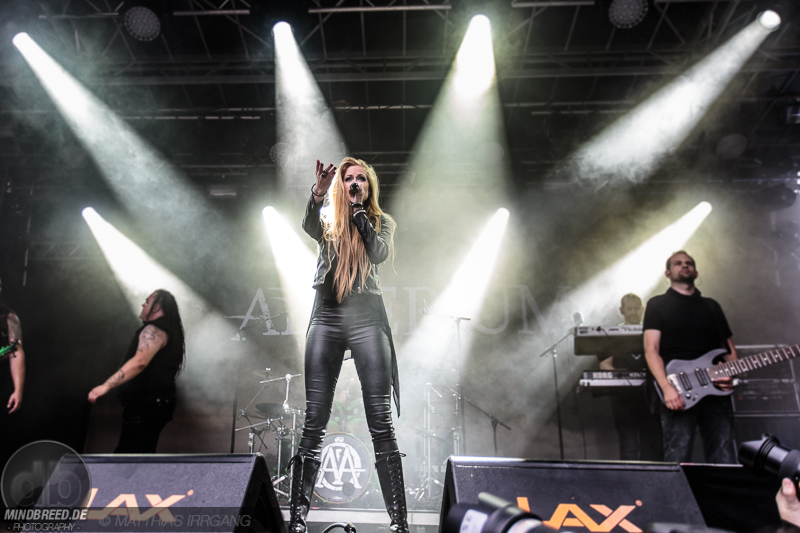 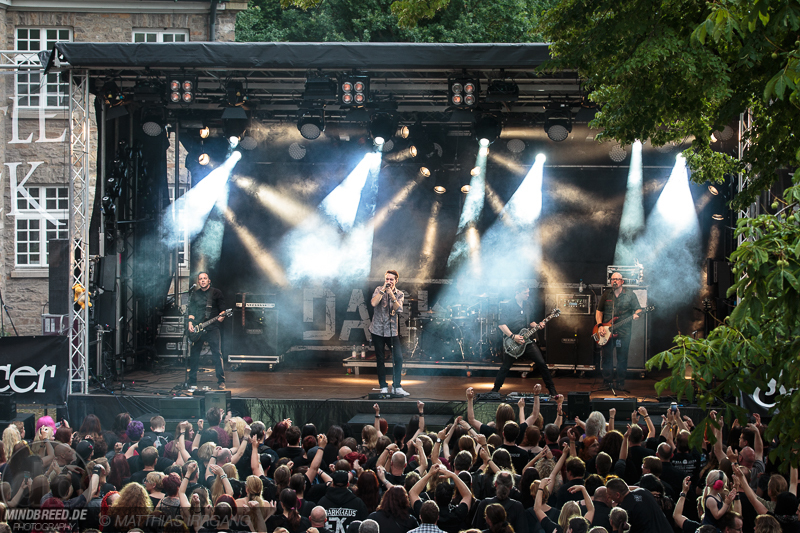 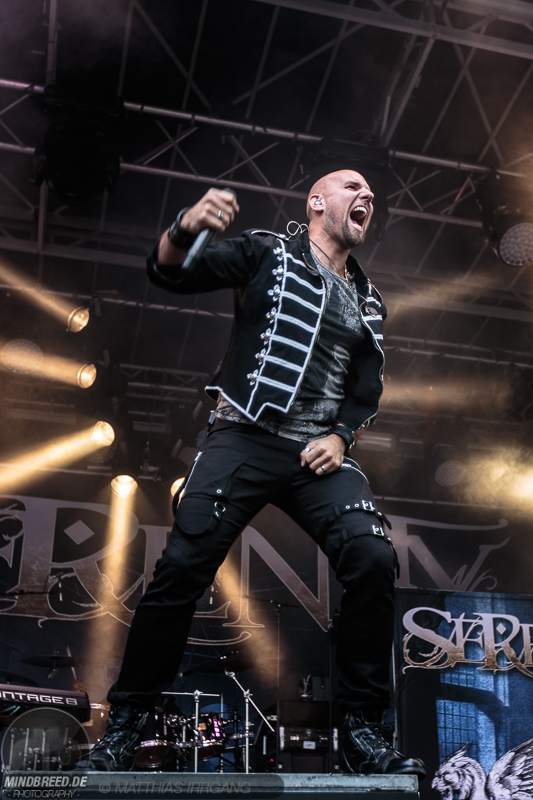 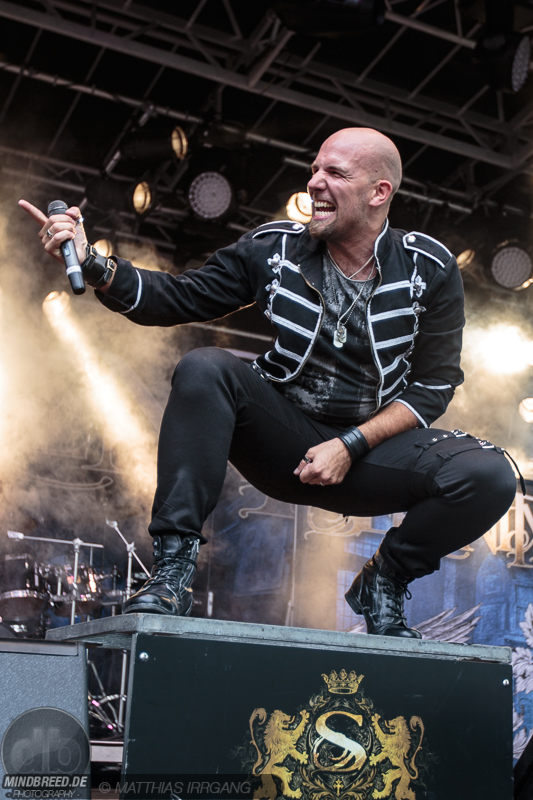 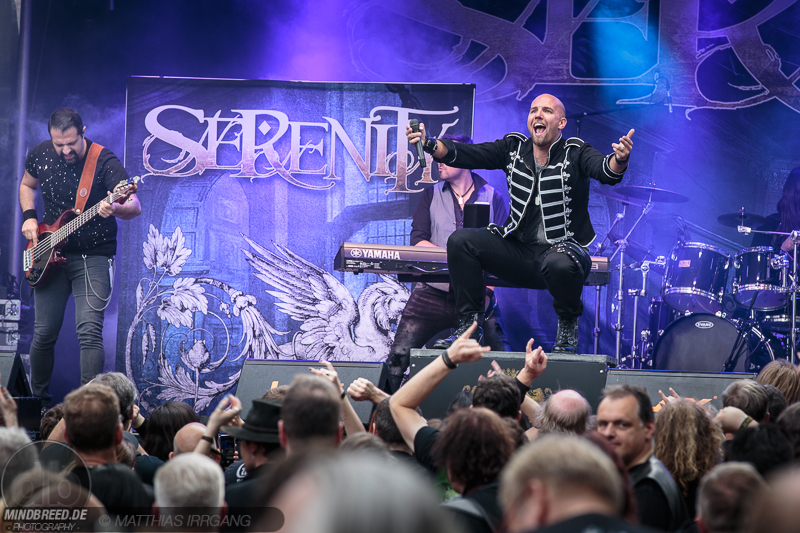 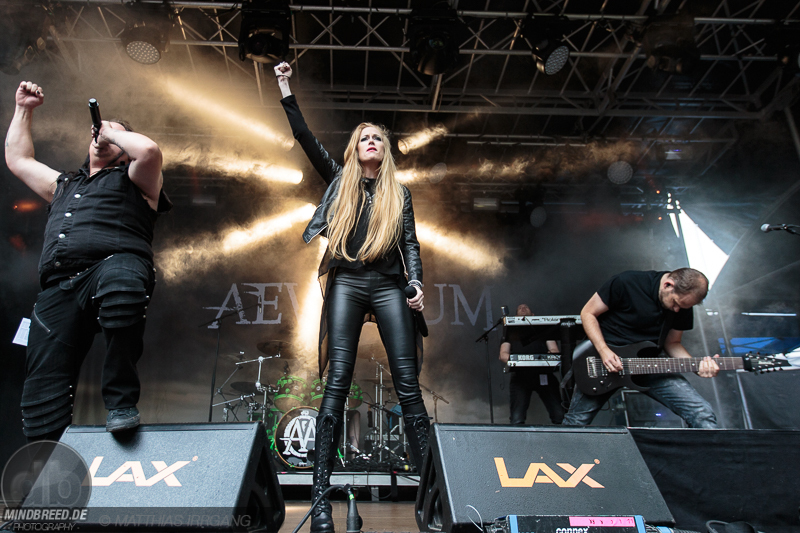 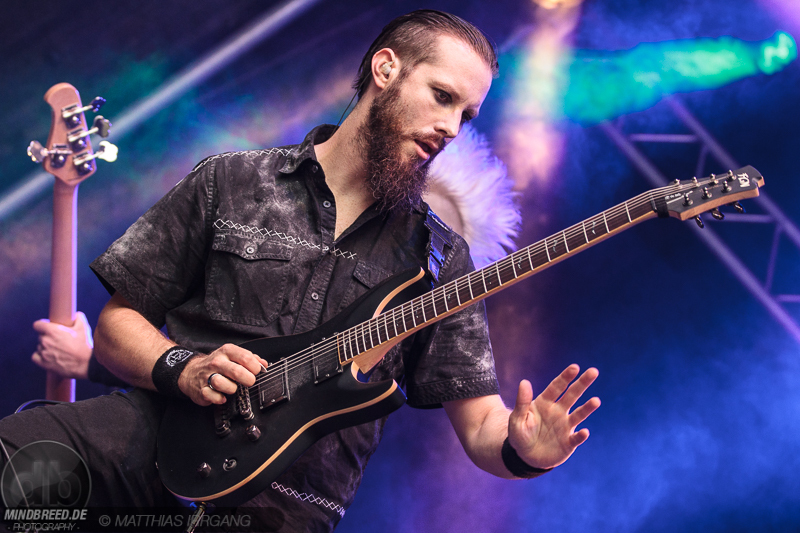 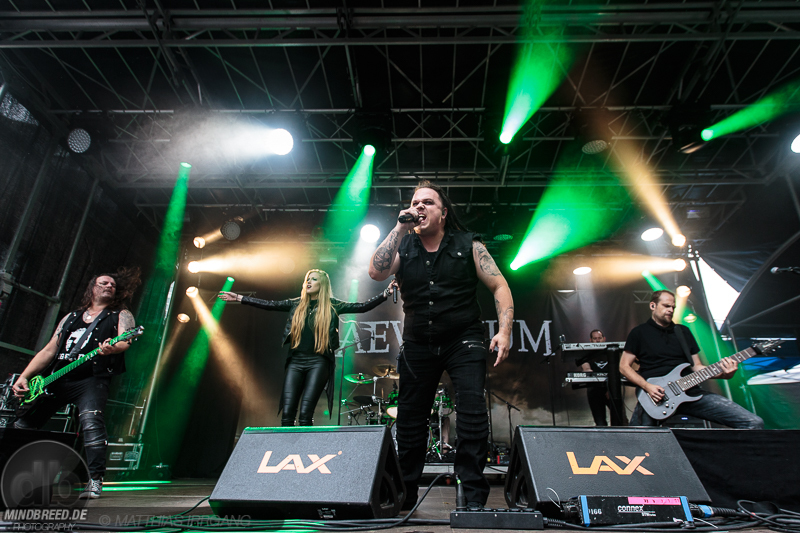 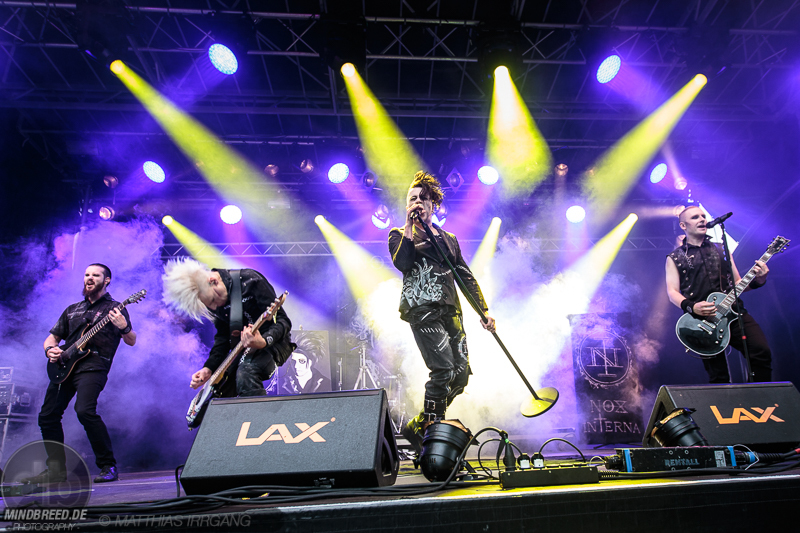 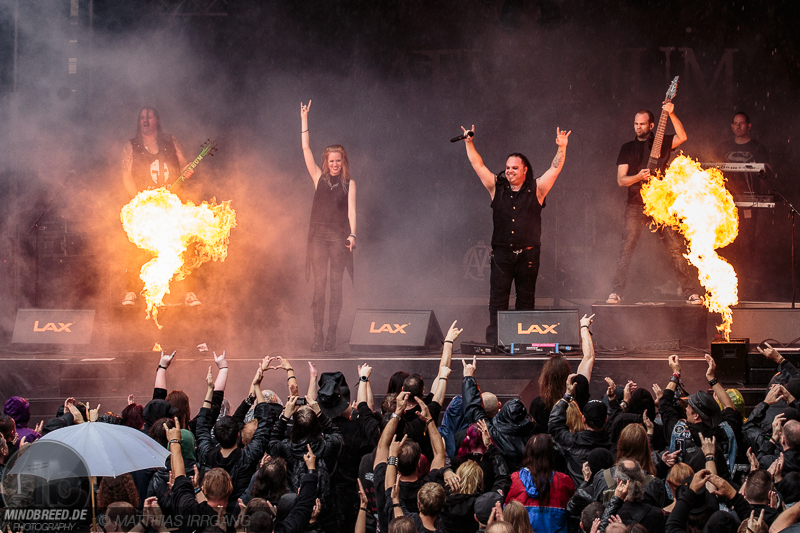 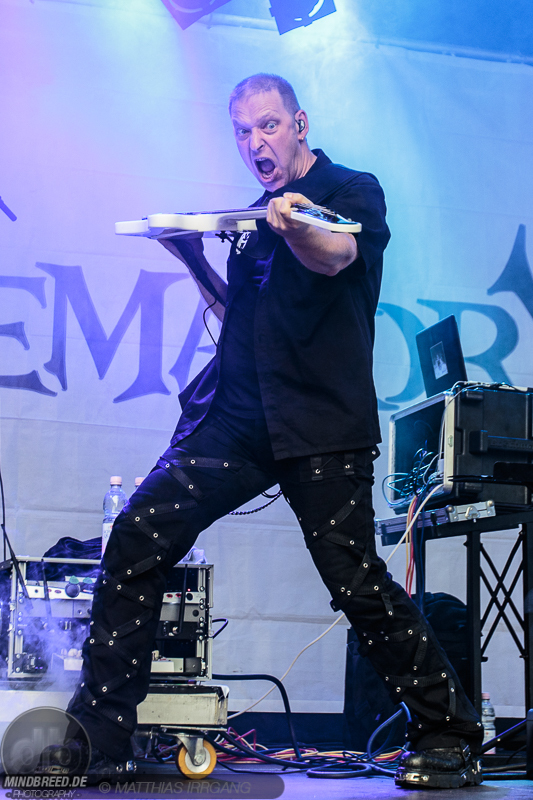 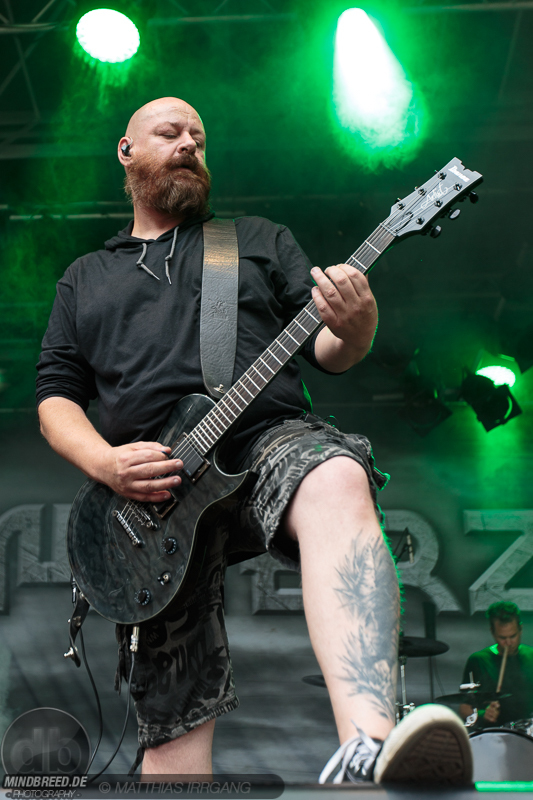 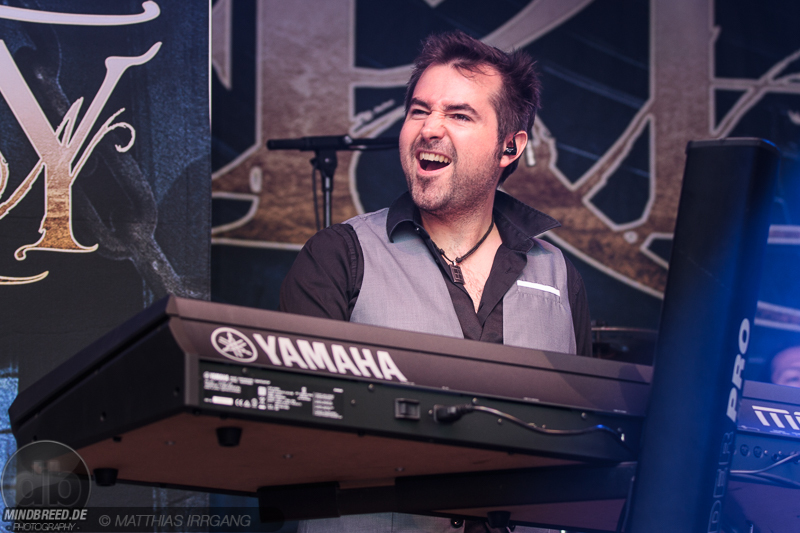 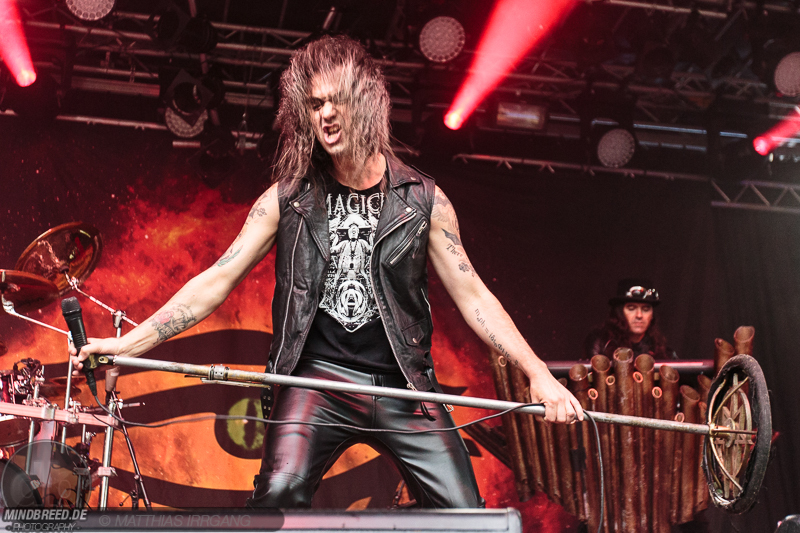 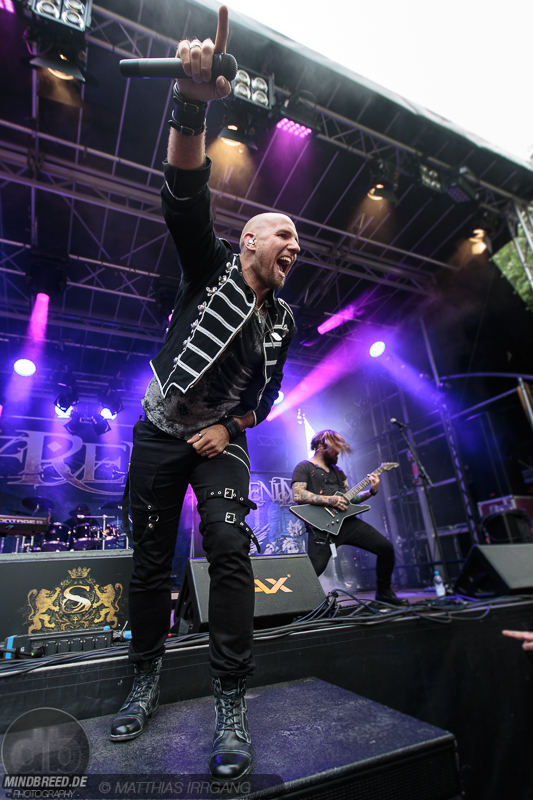 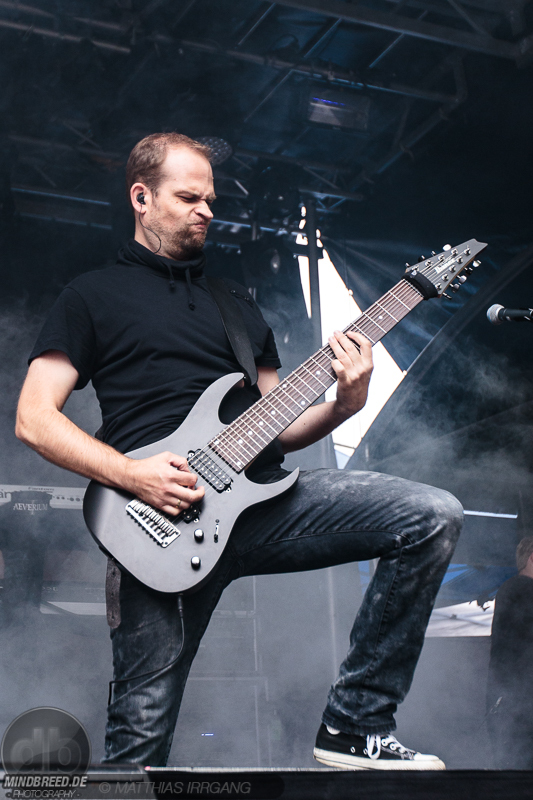 After this fast opener, the festival visitors were able to calm down a bit and to look forward to the Austrian band SERENITY, who was able to thrill with a mixture of symphonic and power metal. 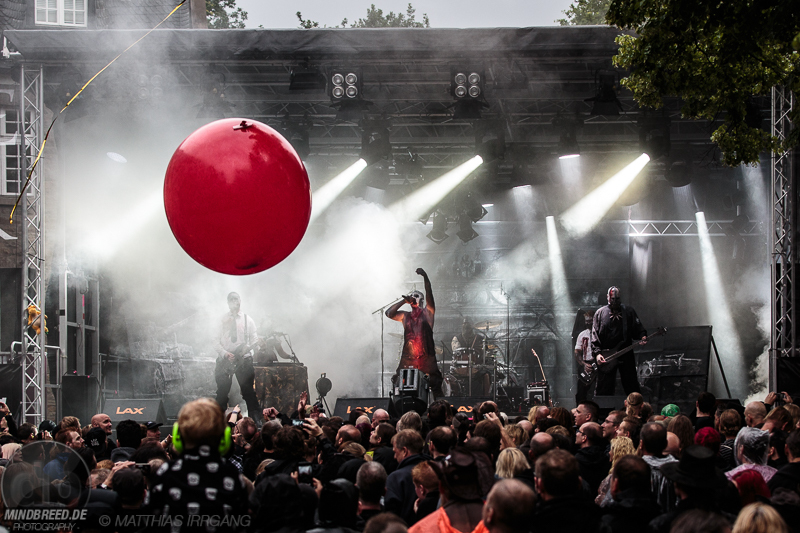 Those who like this kind of music were just right, a great set was delivered, the audience went on with a good mood. 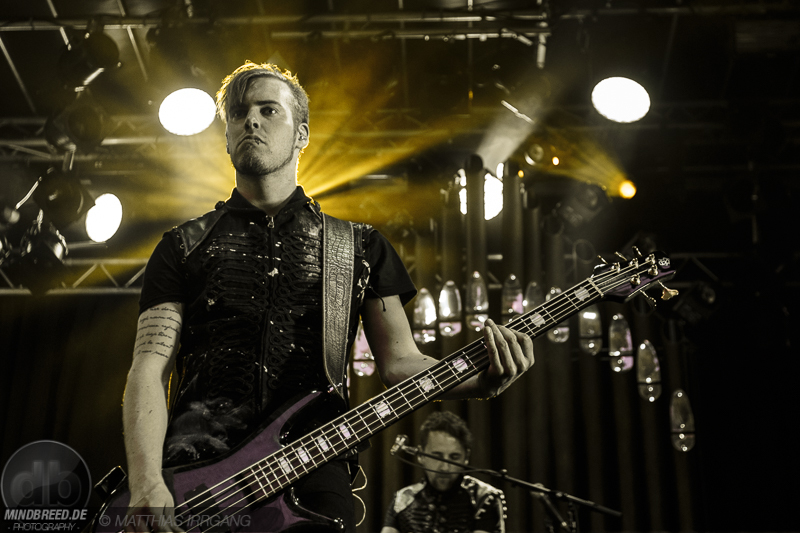 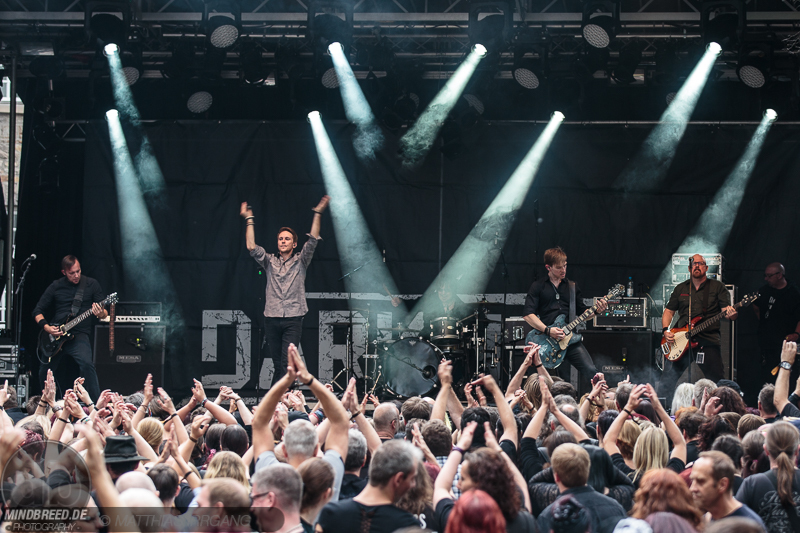 After this, we went on with Dark Rock from the young Scottish band DARKHAUS. 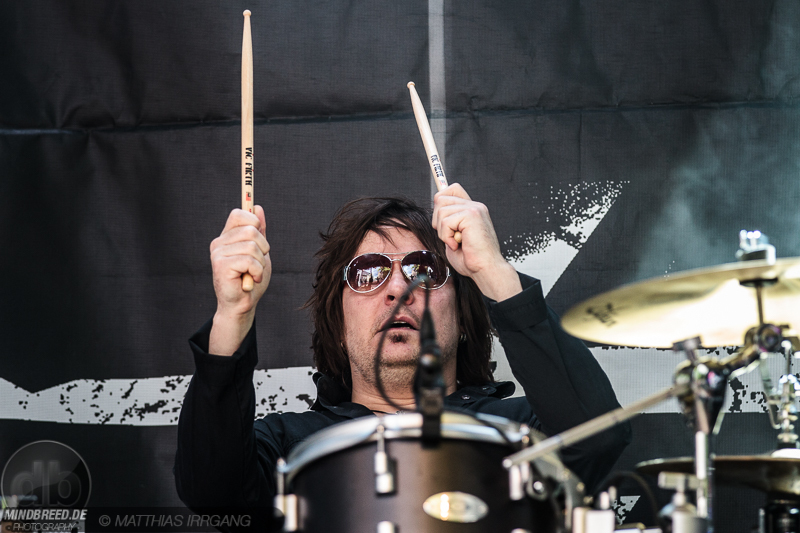 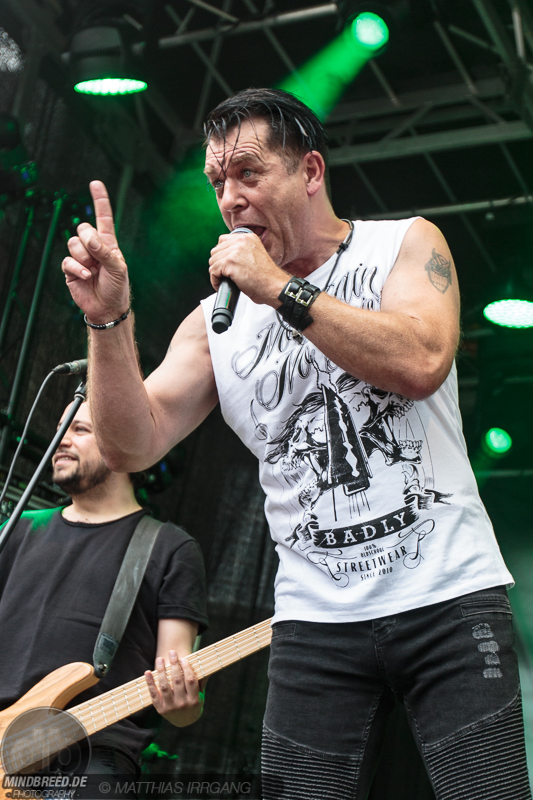 Front man Ken Hanlon caught the audience quickly together with his men, so it was not surprising that they supported the band in every way. 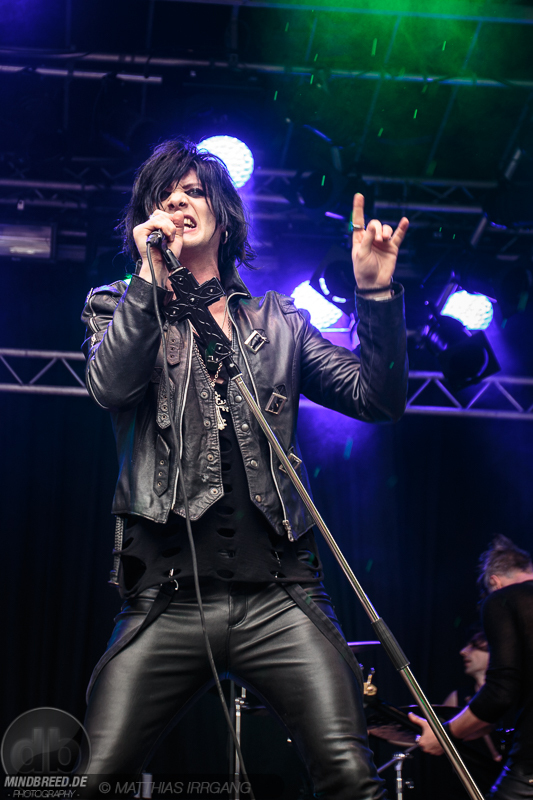 The last performance on this Friday evening was the American opera singer THE DARK TENOR who skilfully combines operas and symphonies with modern pop and rock elements to form an exciting crossover. 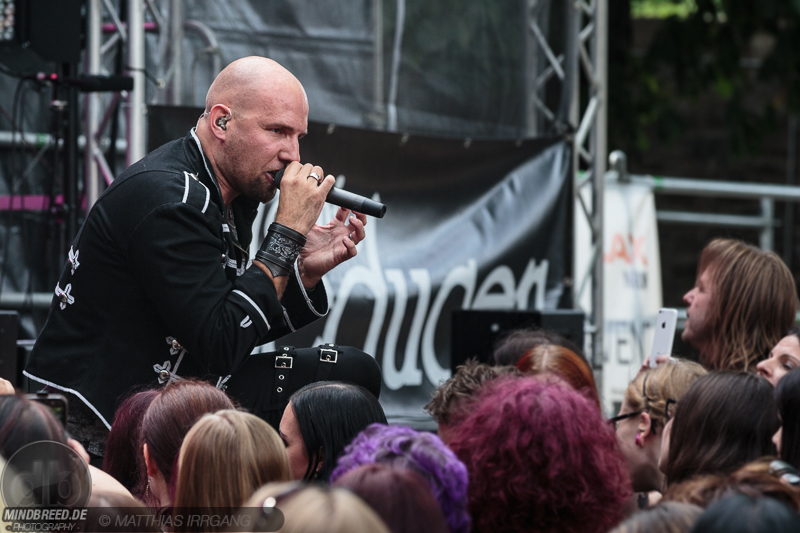 The guests in Castle Broich were tied by the astounding voice of the still unknown tenor and followed a great show on the stage. 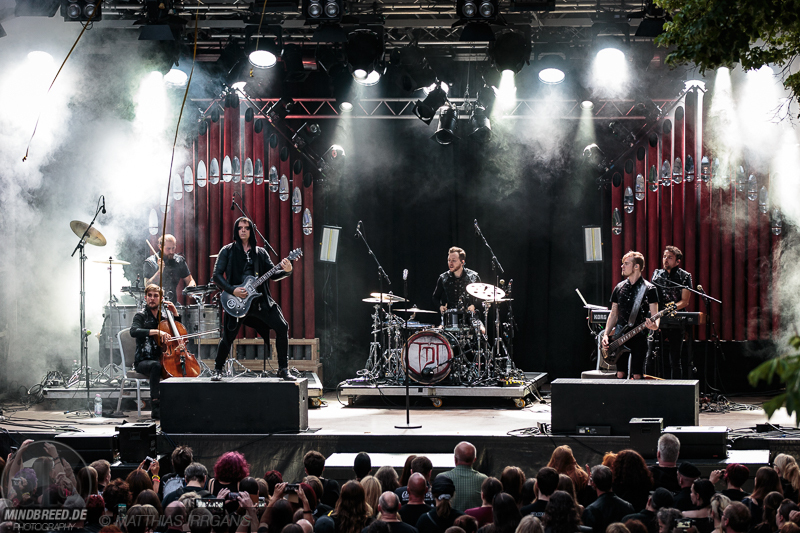 There was a magic spell on the castle, which ended around 10 pm when the last notes fell silent and thus settled the first day of Castle Rock. 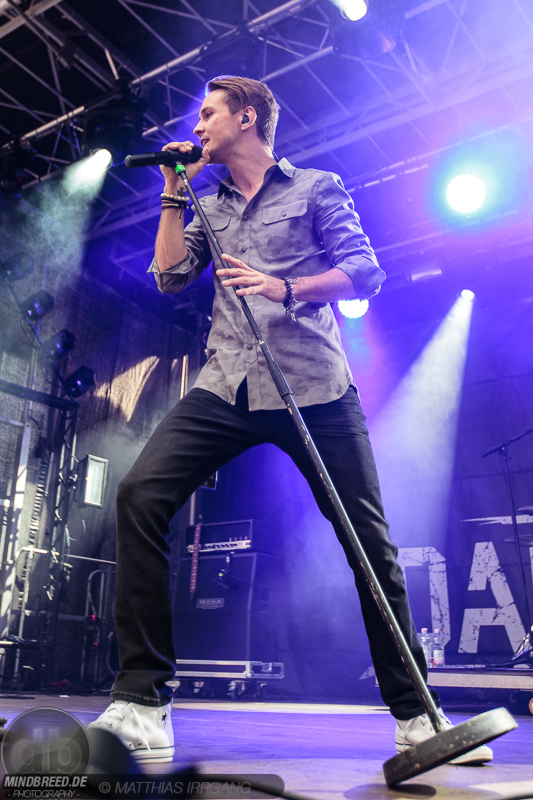 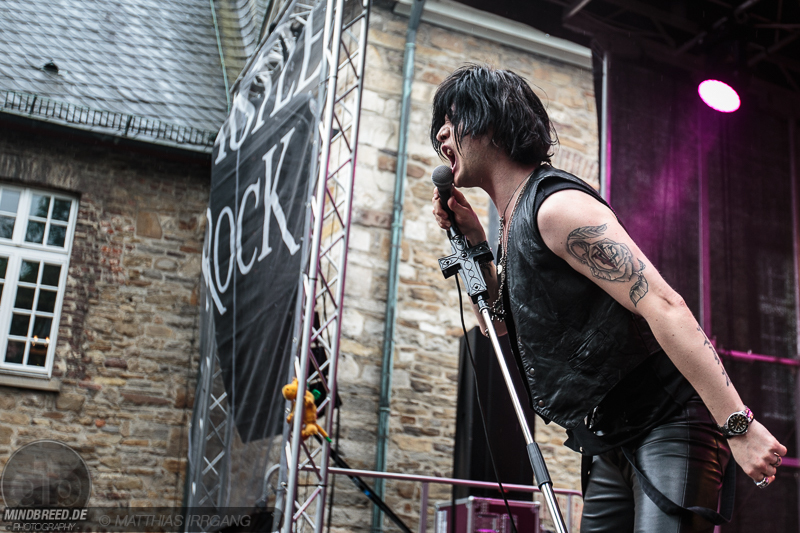 On Saturday, the Castle Rock Festival was opened a quarter past twelve. 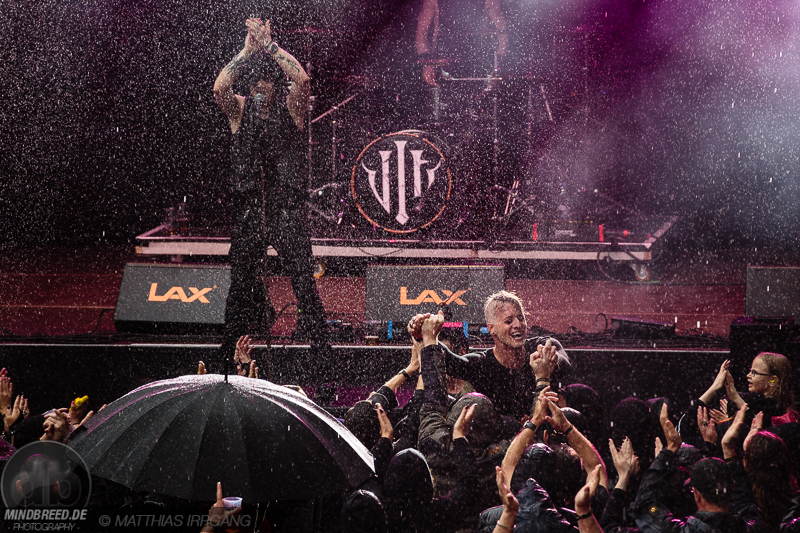 The weather forecast did not leave a good impression, but that won't stop anyone from having fun at this festival. 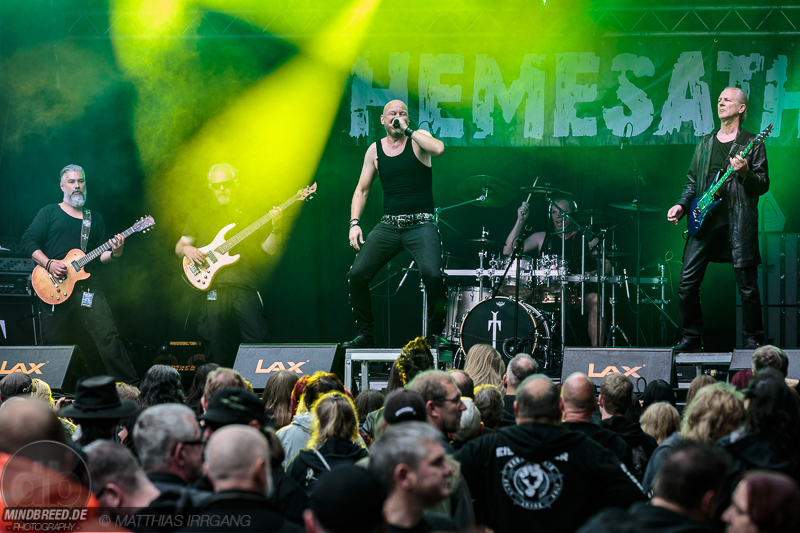 A very good Saturday opener, however, was the band HEMESATH which plays hard German rock, and they understood it to entertain the early festival visitors. 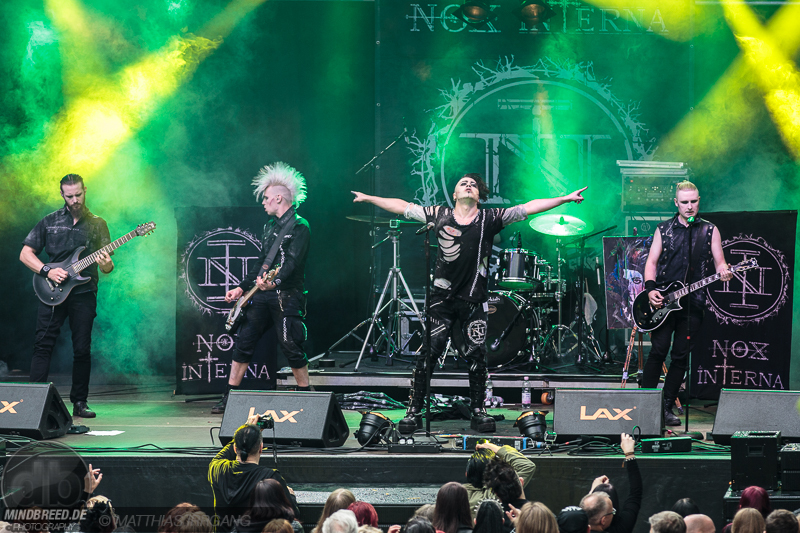 NOX INTERNA was the second act of the day after a short changeover. 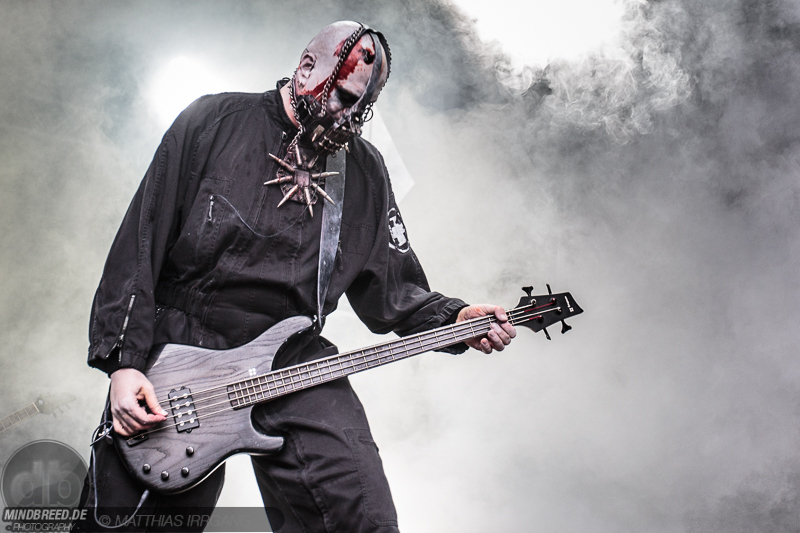 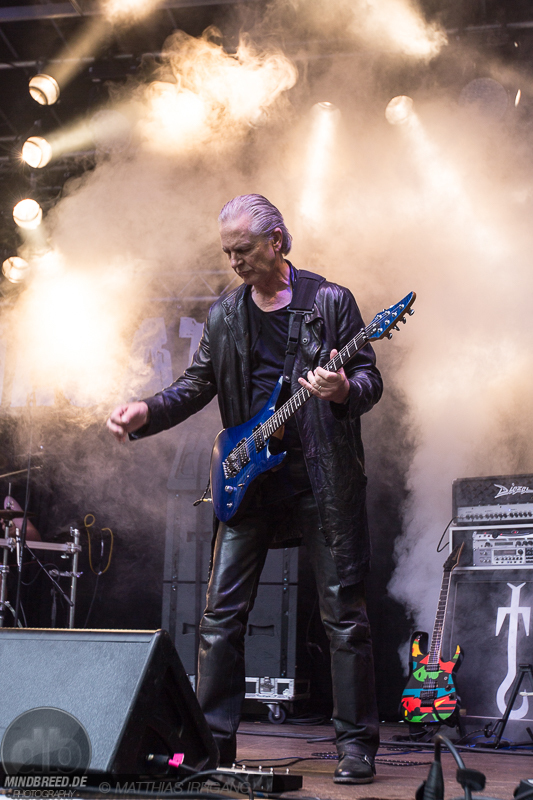 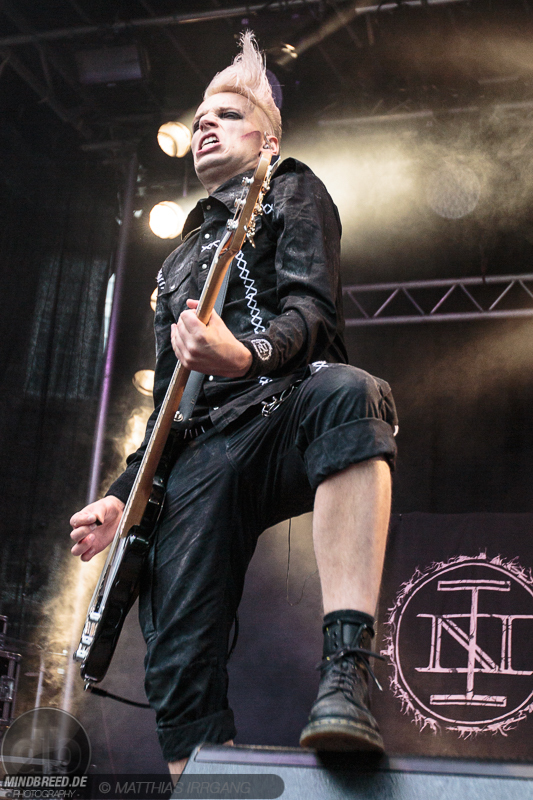 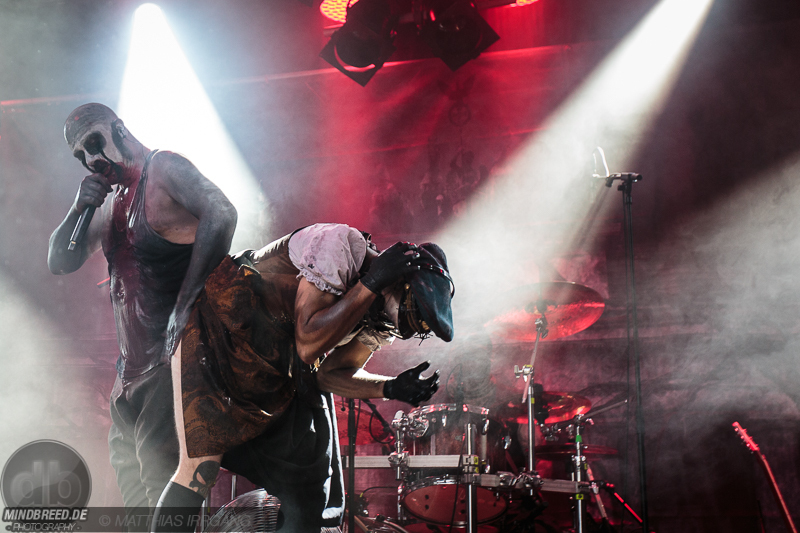 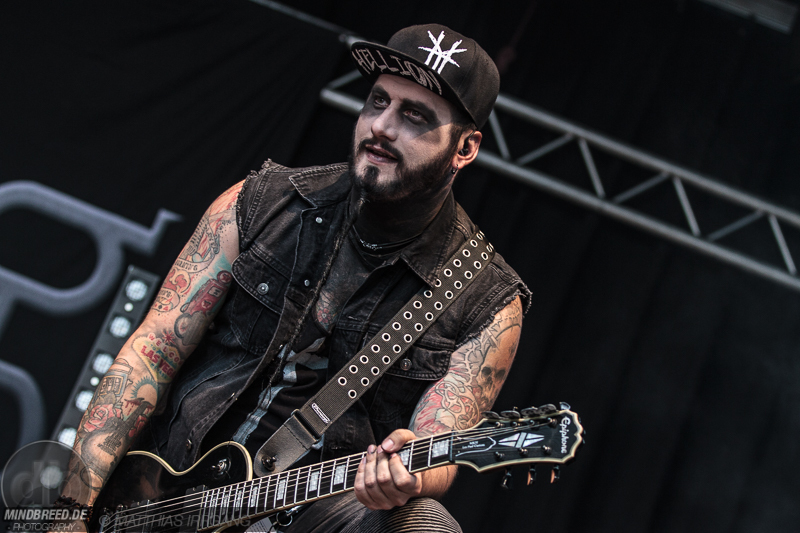 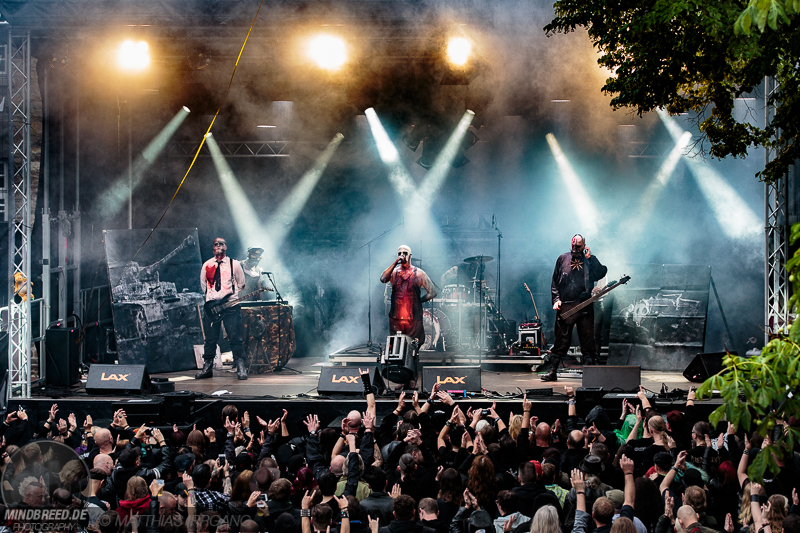 The audience liked the good mix of Industrial Metal and Old-school Goth Rock, which the Madrilenians offered. 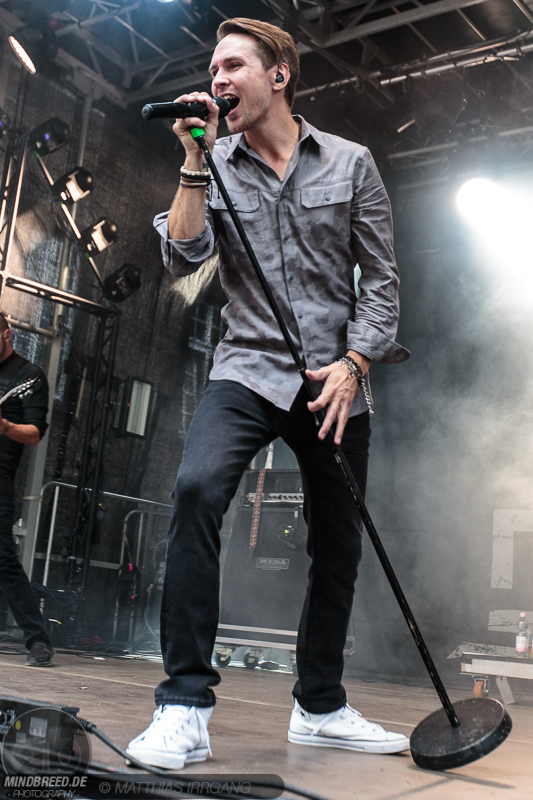 Now it was time for Neue Deutsche Härte from ERDLING, a very young band which had a rather steep start of their career. 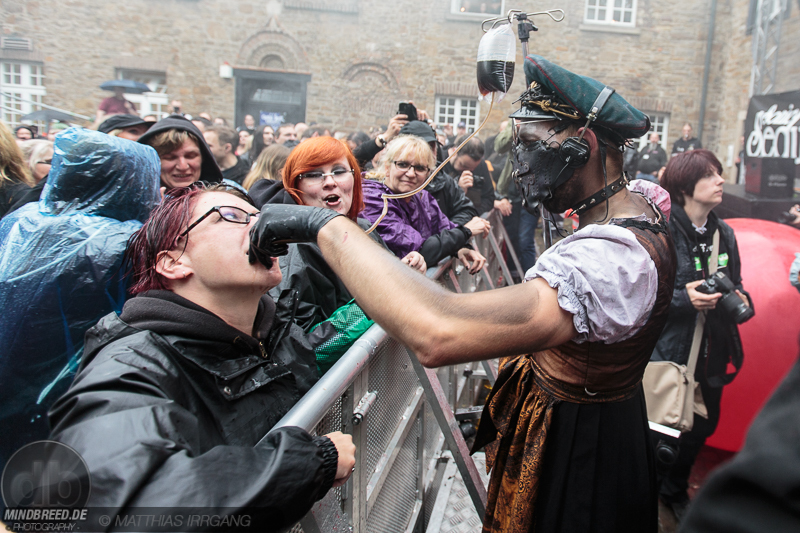 In order to meet the expectations, the four boys gave everything, and the visitors at Castle Broich were very enthusiastic. 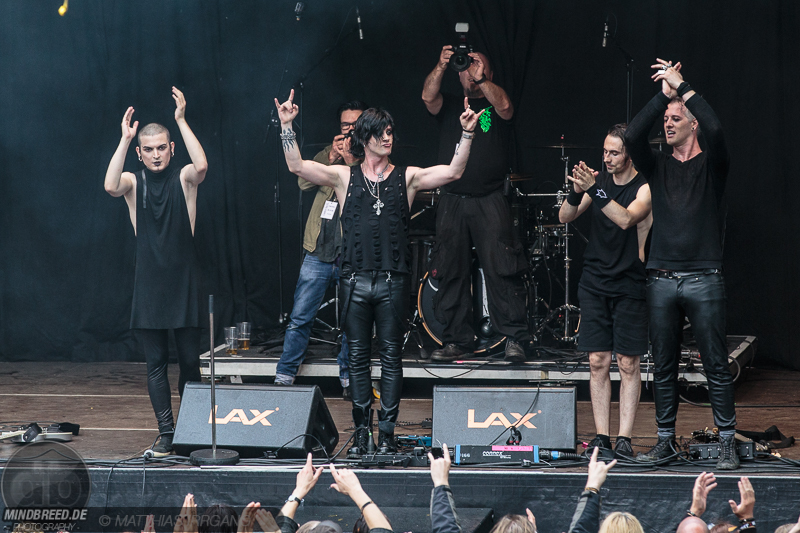 Next one was Italian dark rock from Berlin – VLAD IN TEARS. 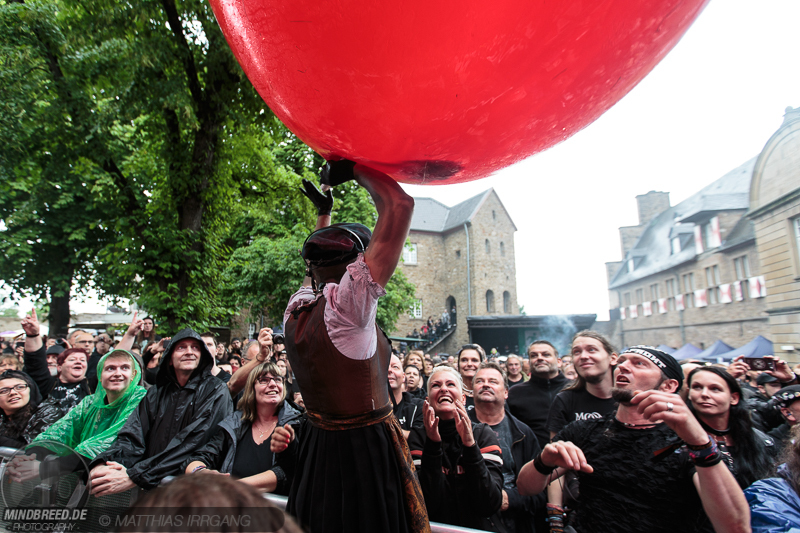 A great performance was delivered which the present audience celebrated, even if rain was increasing in the meantime. 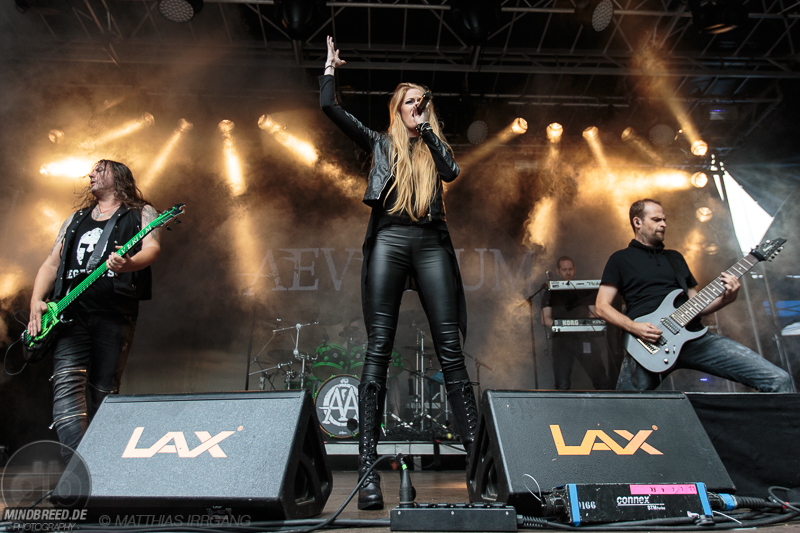 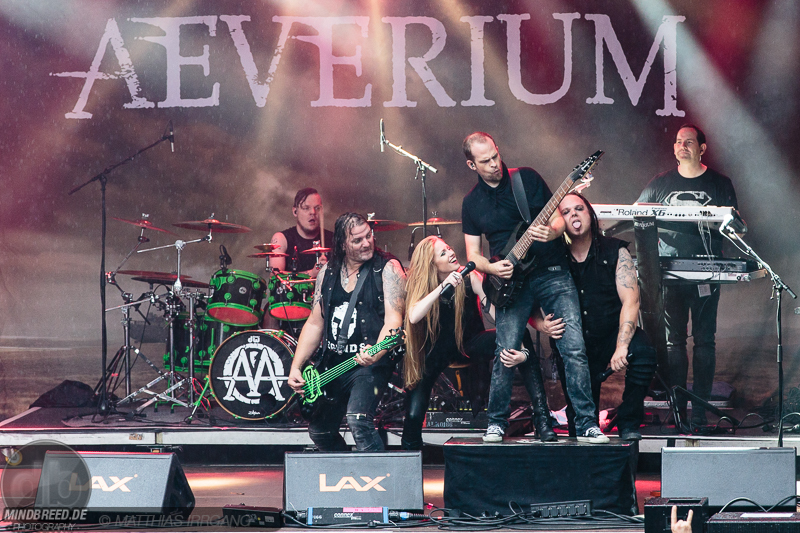 Definitely, a highlight of this day was the next performance - Aeva and her five gentlemen of the Viersen based band AEVERIUM. 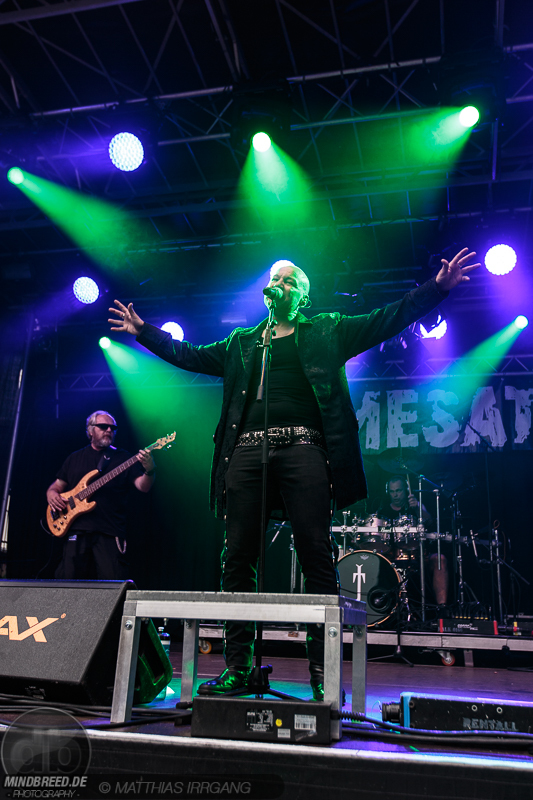 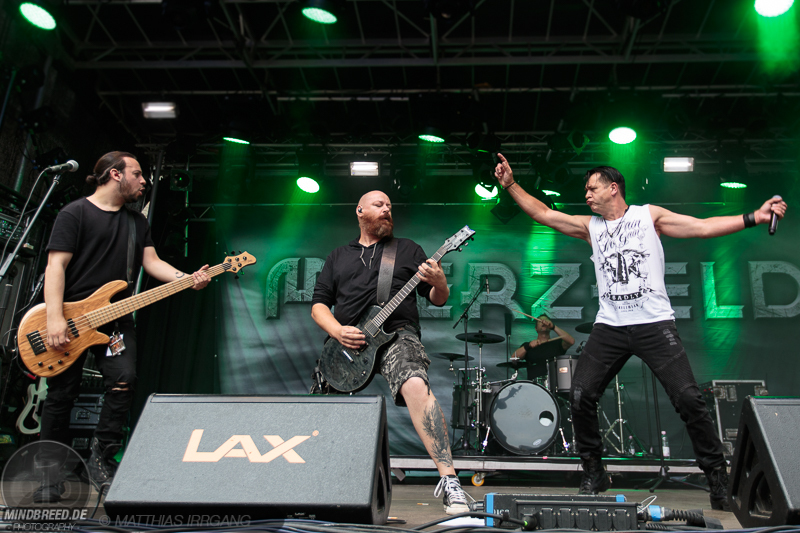 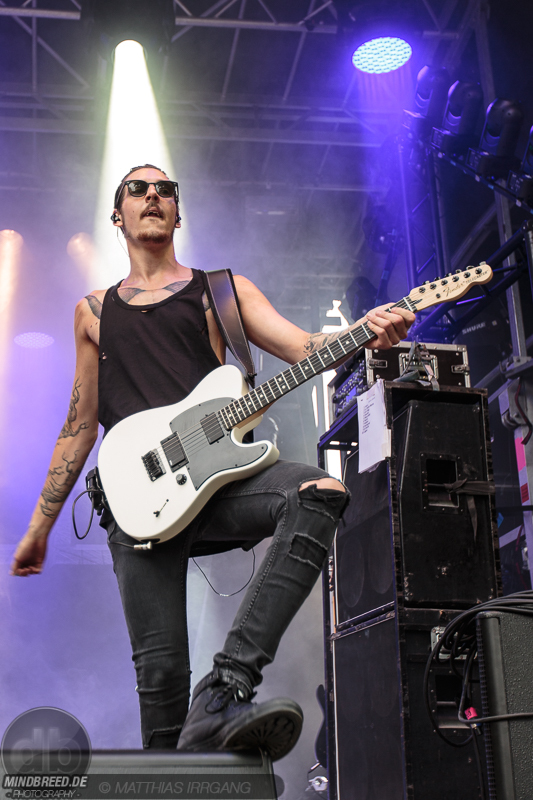 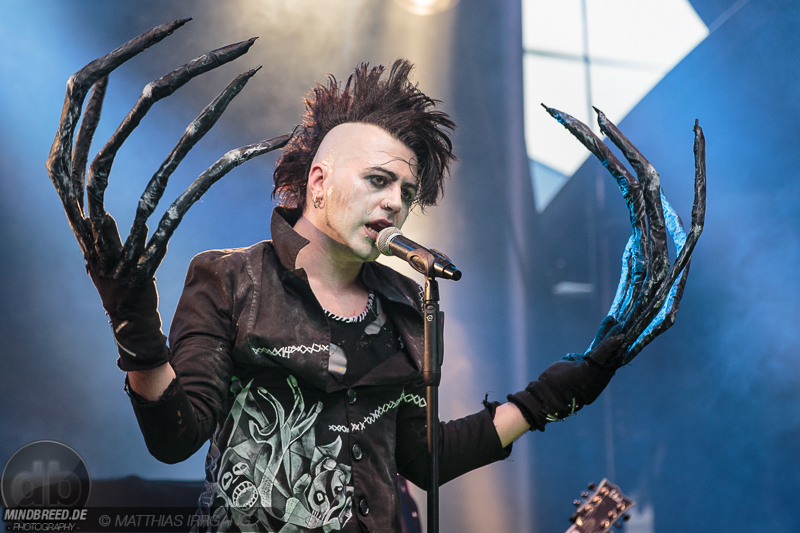 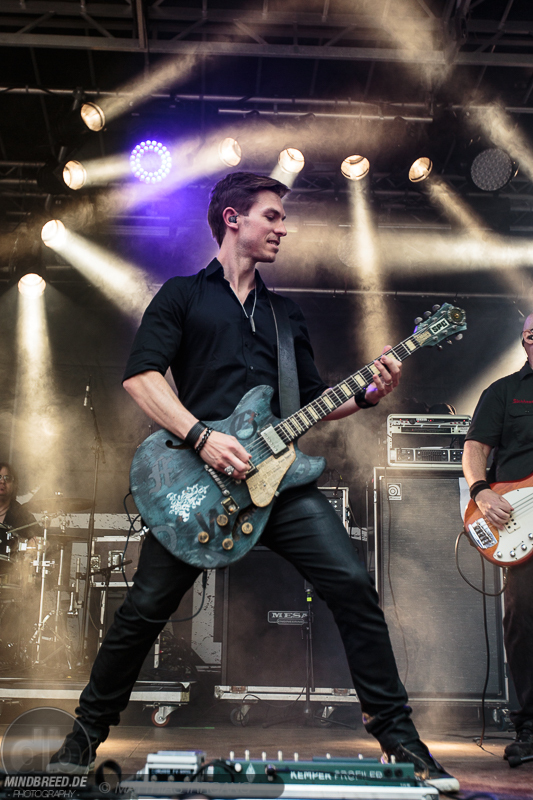 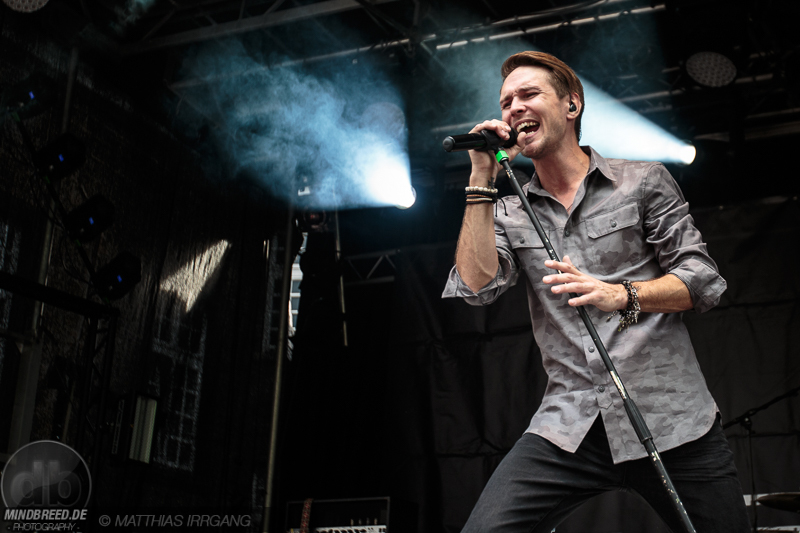 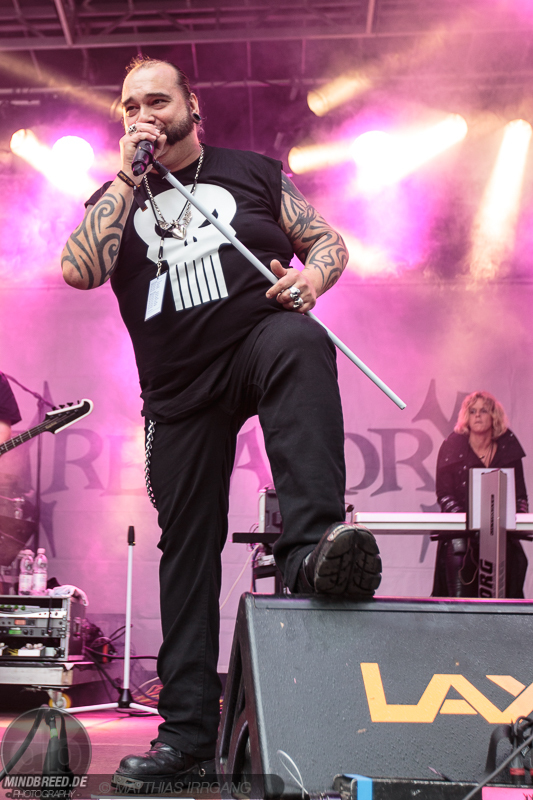 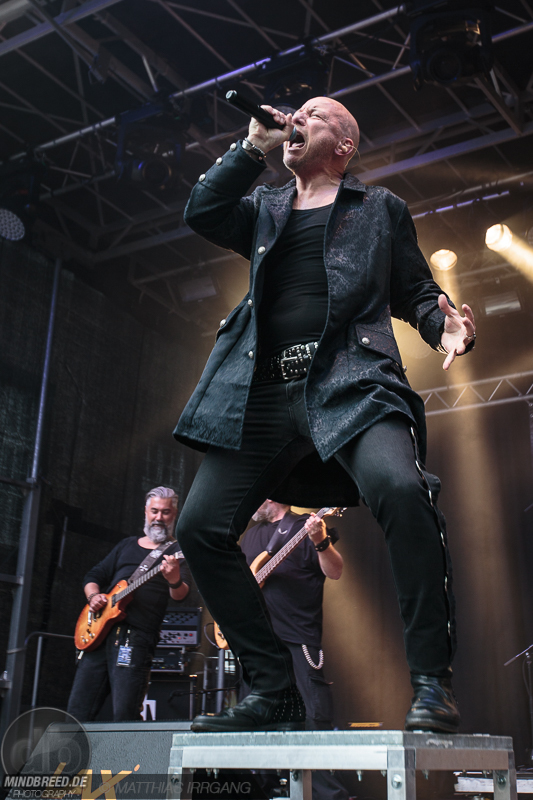 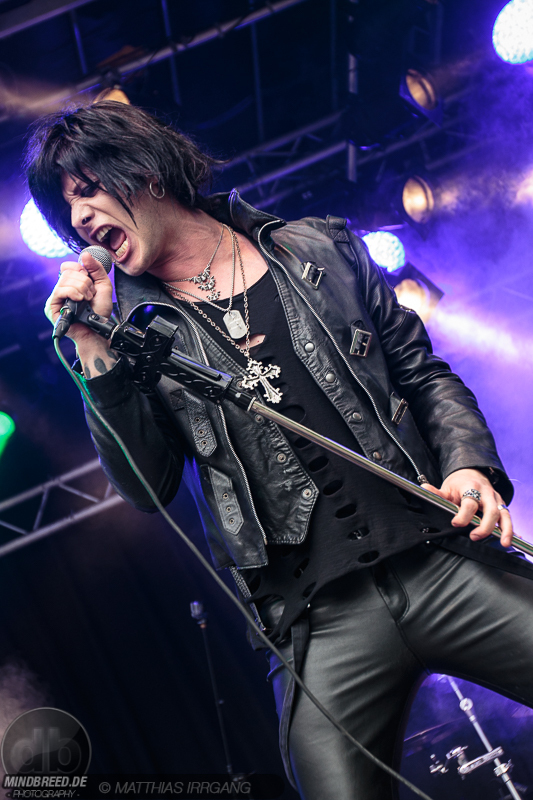 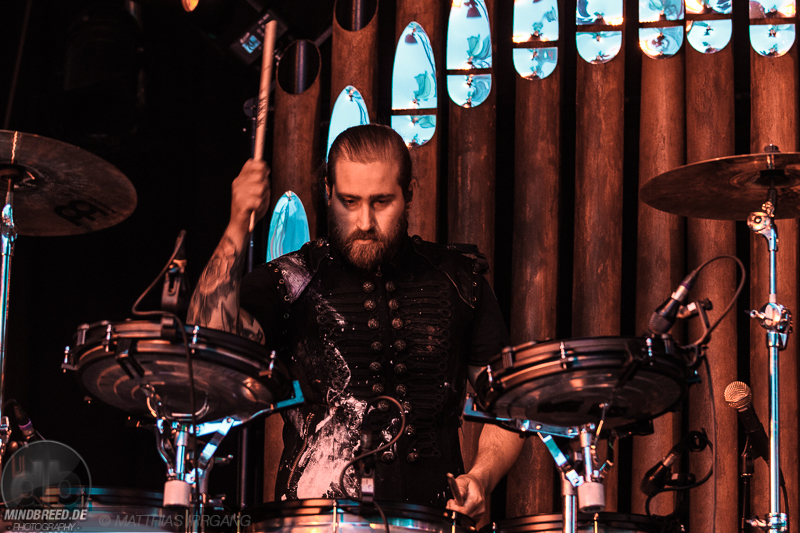 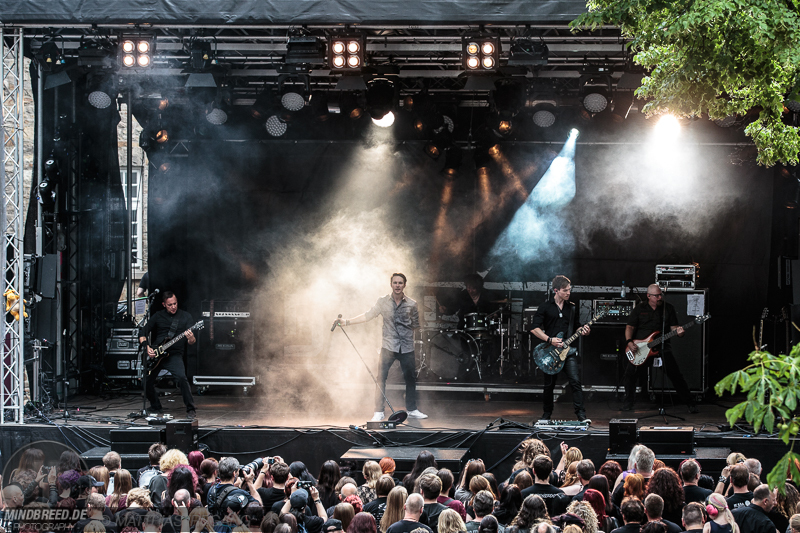 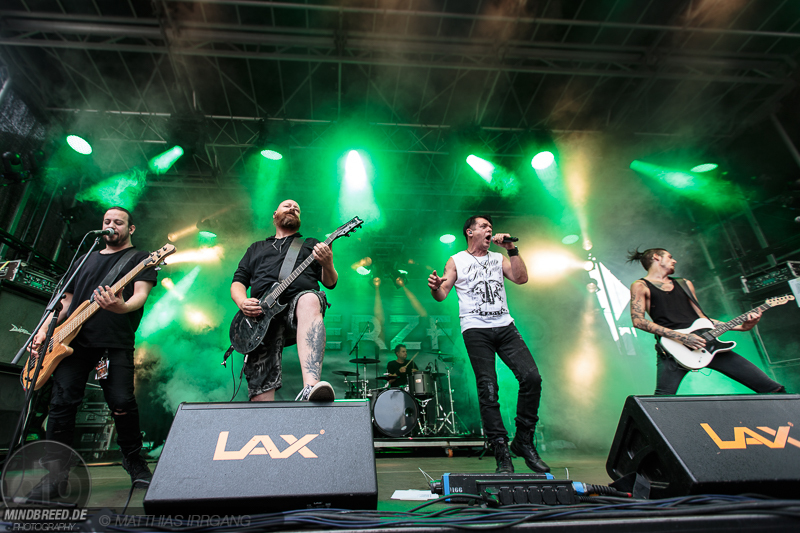 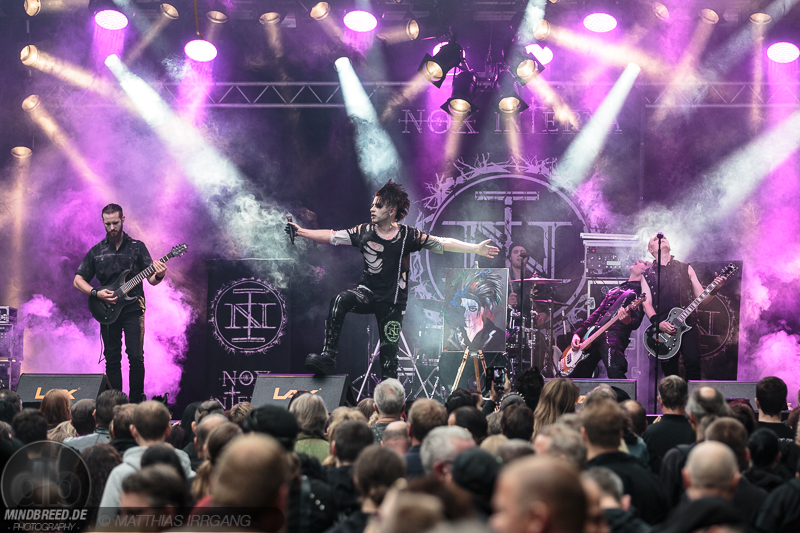 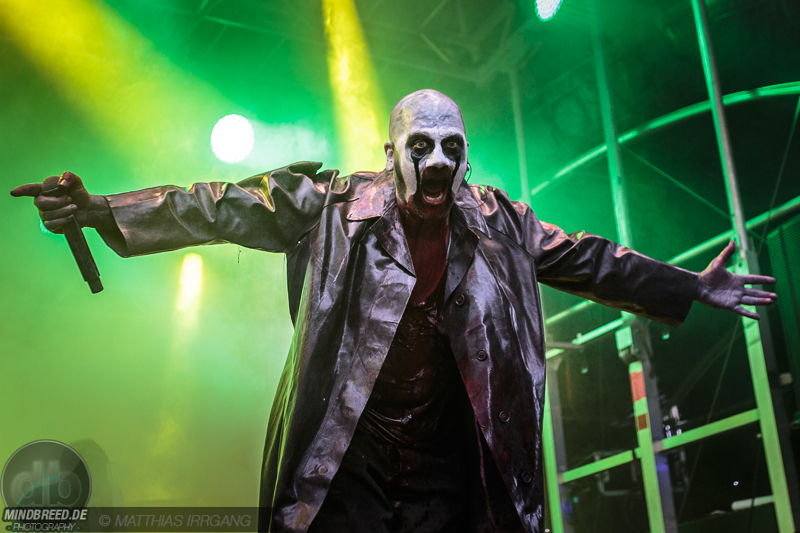 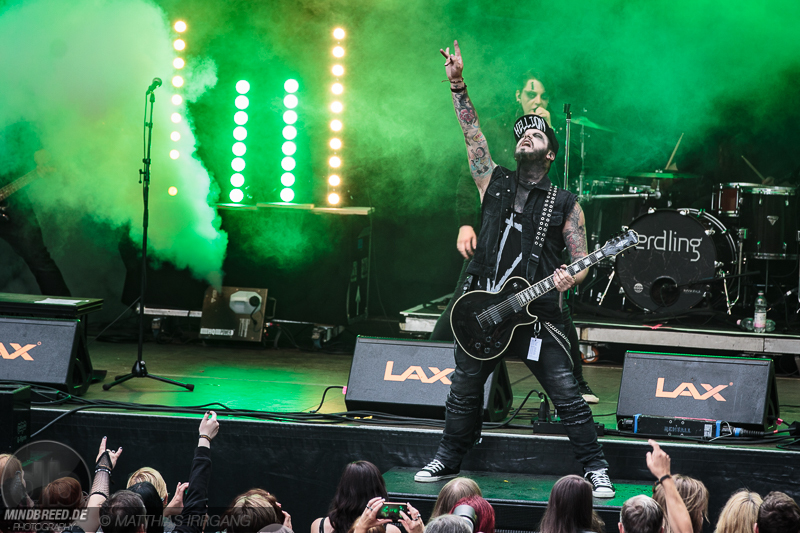 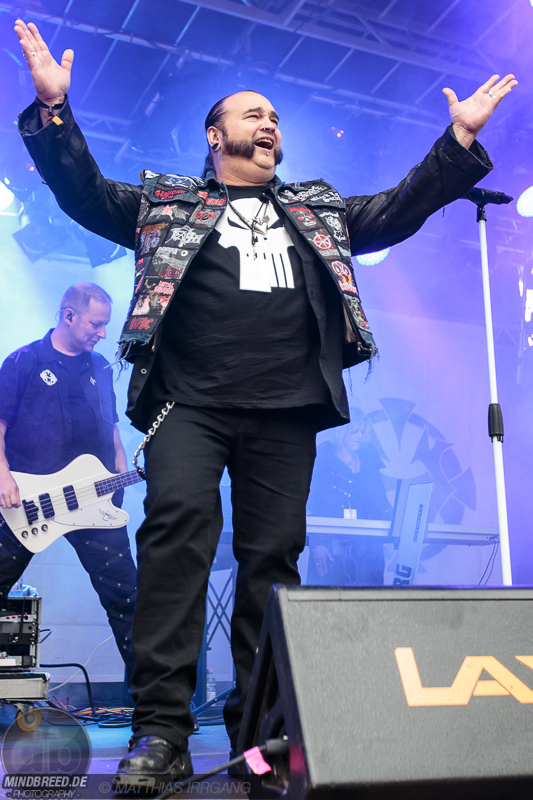 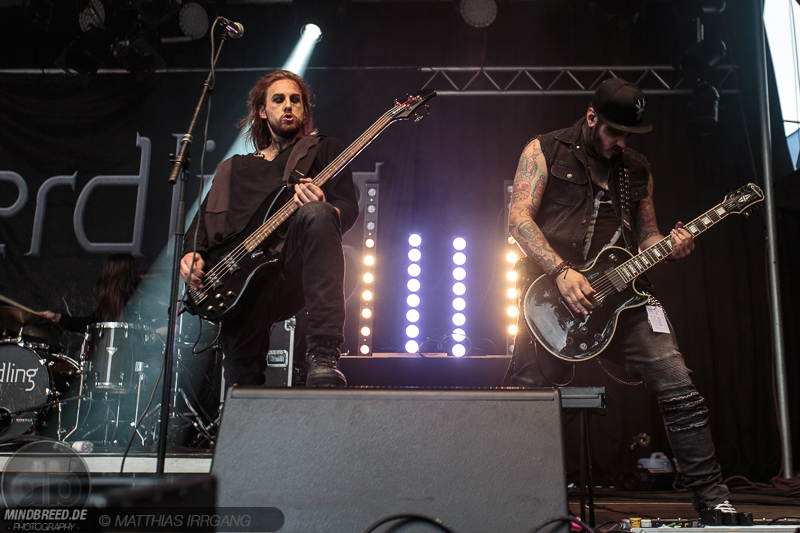 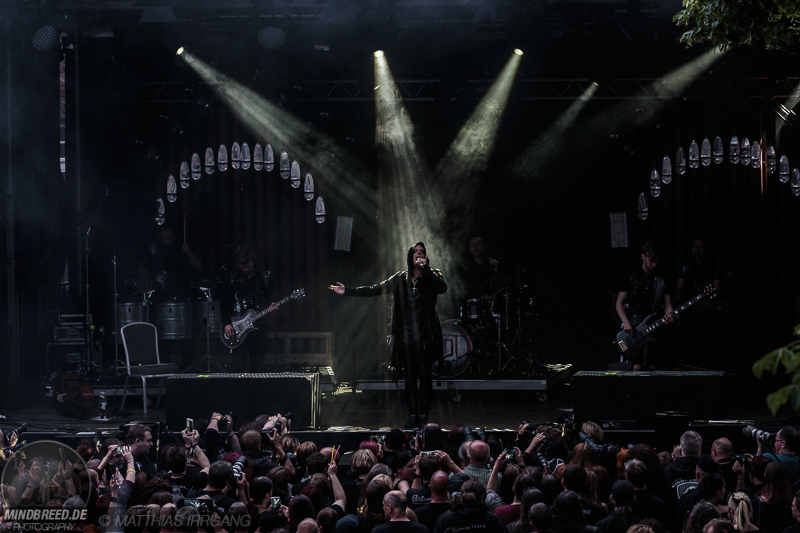 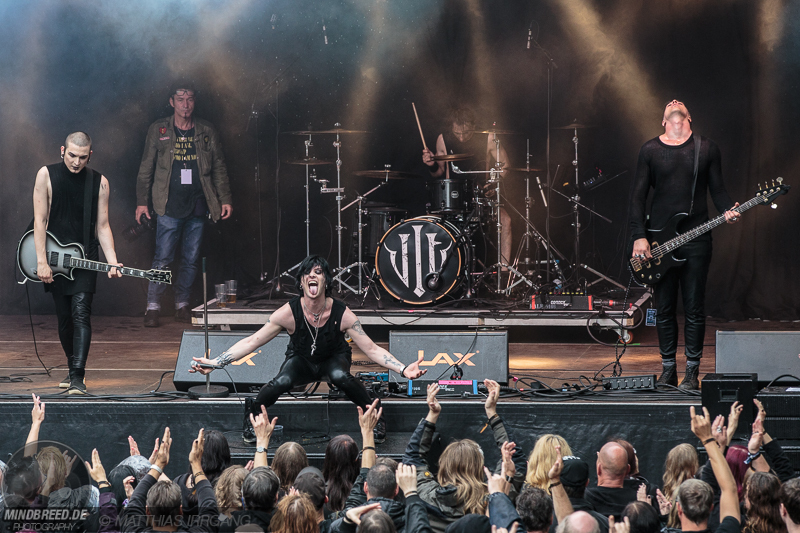 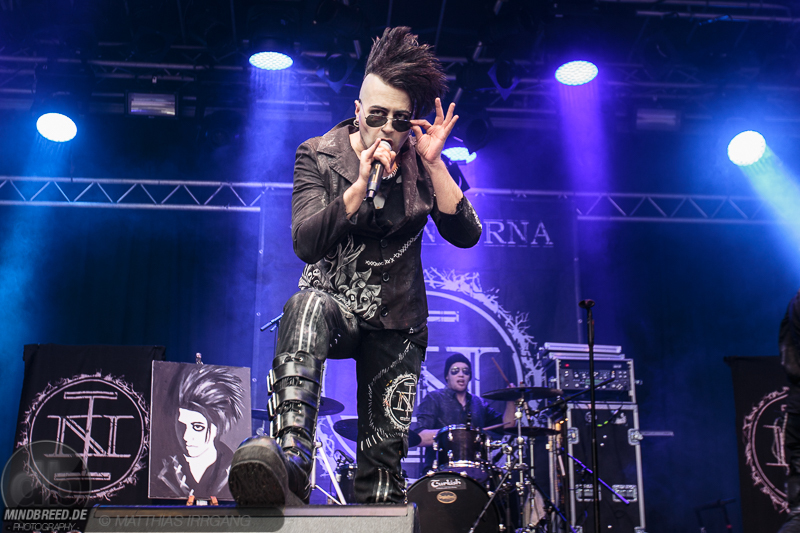 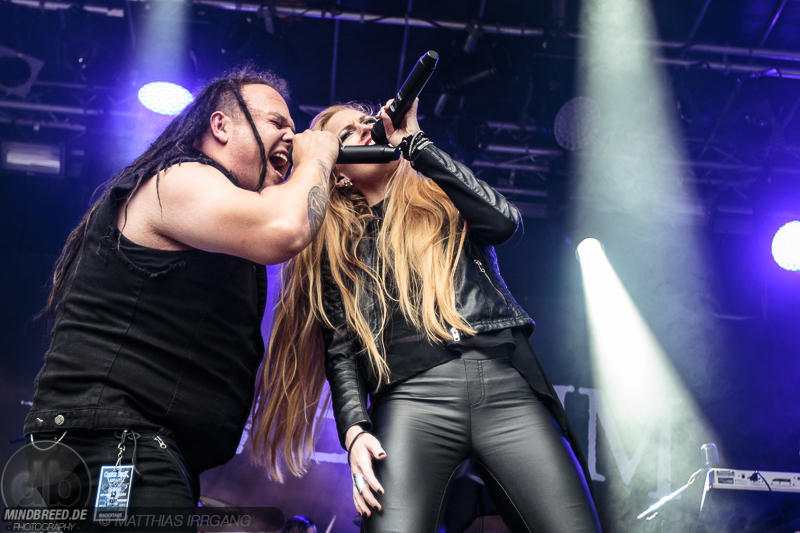 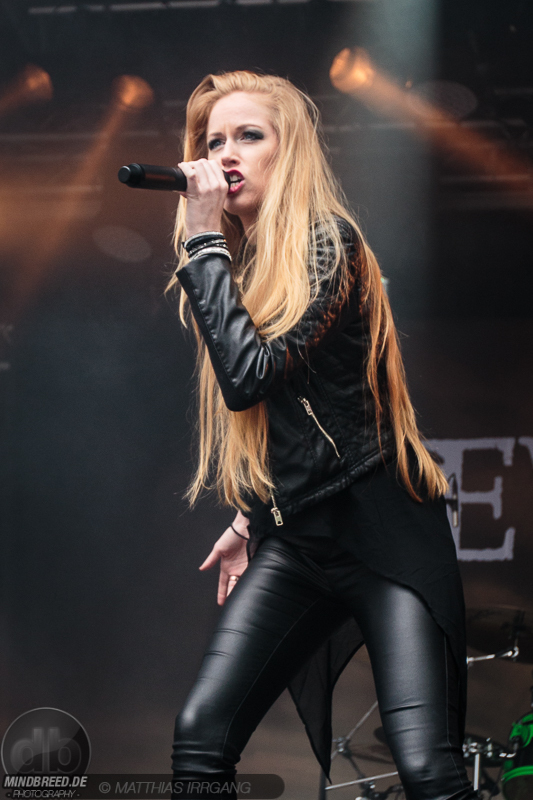 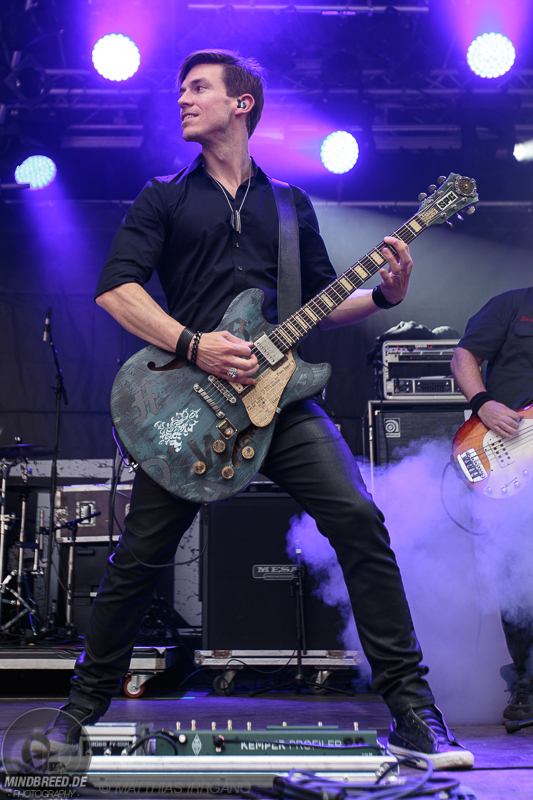 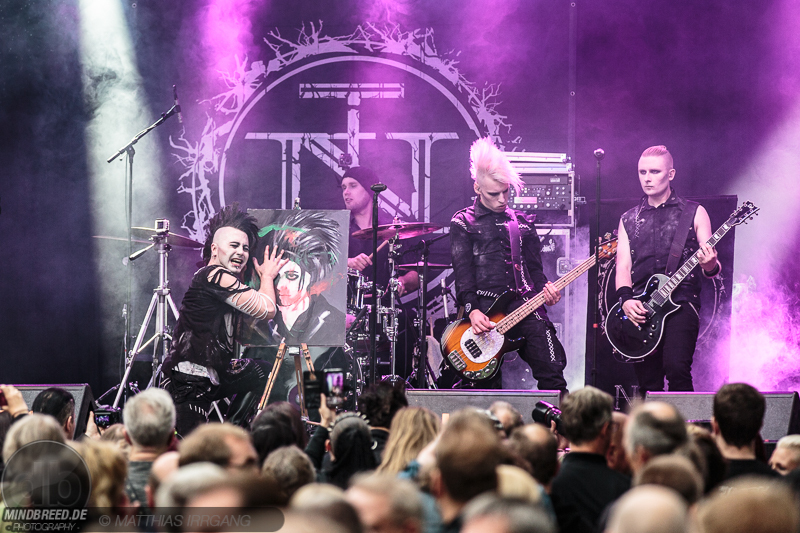 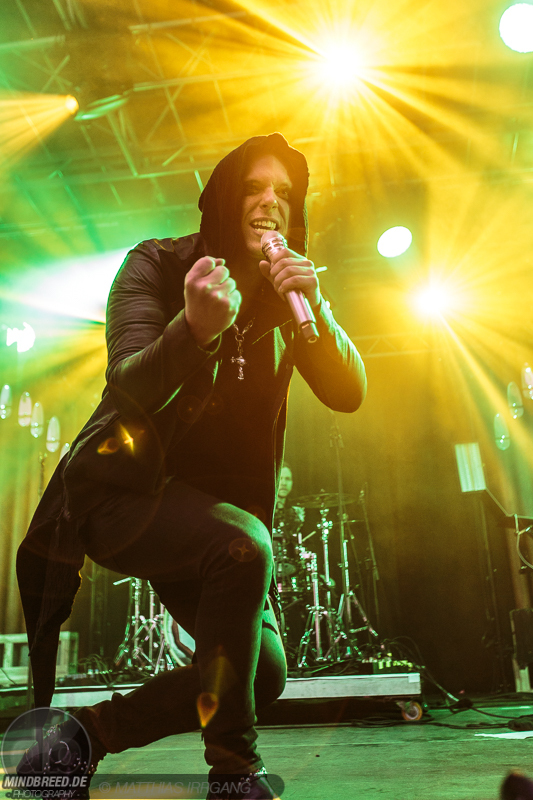 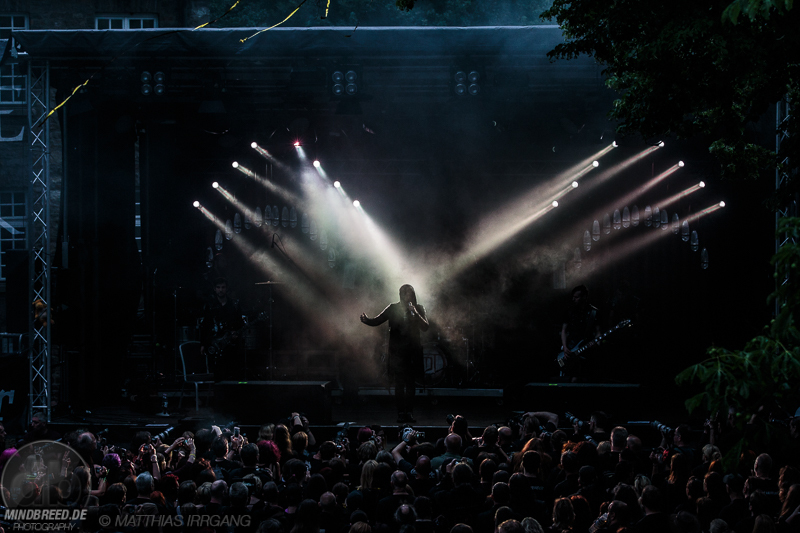 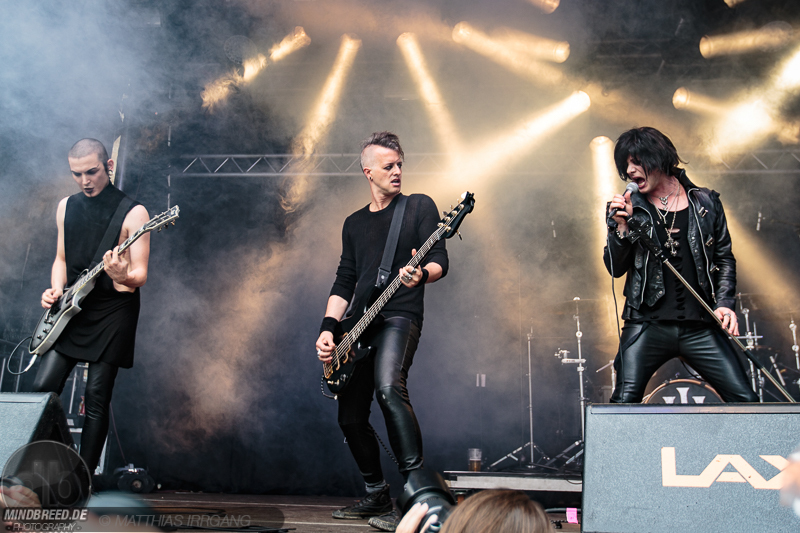 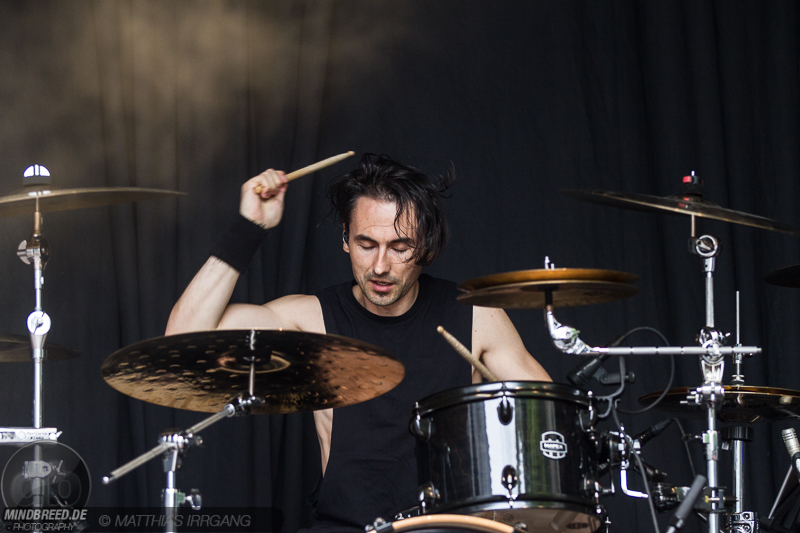 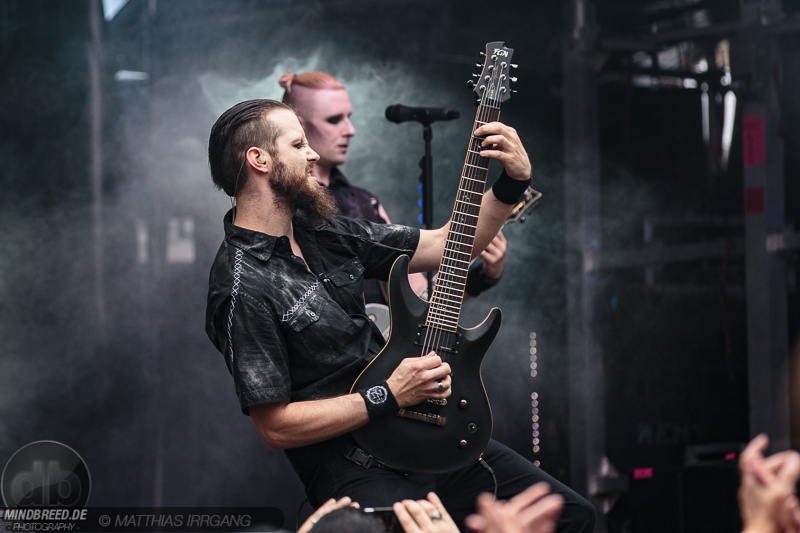 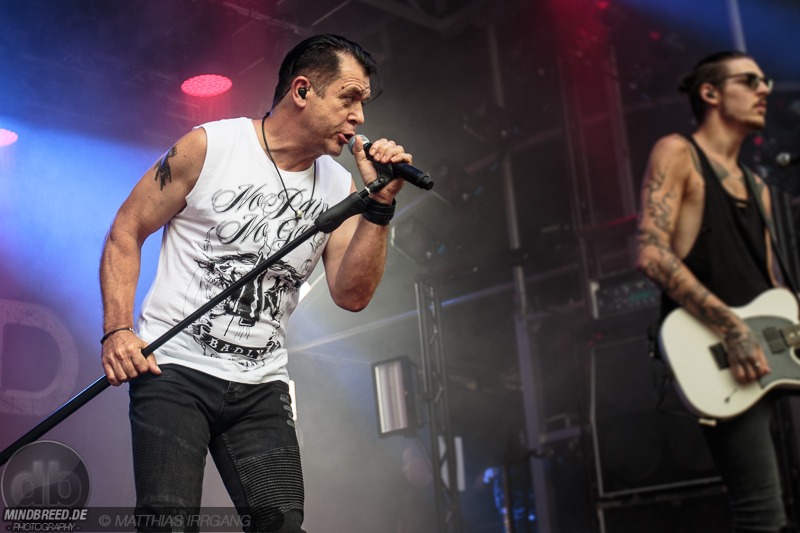 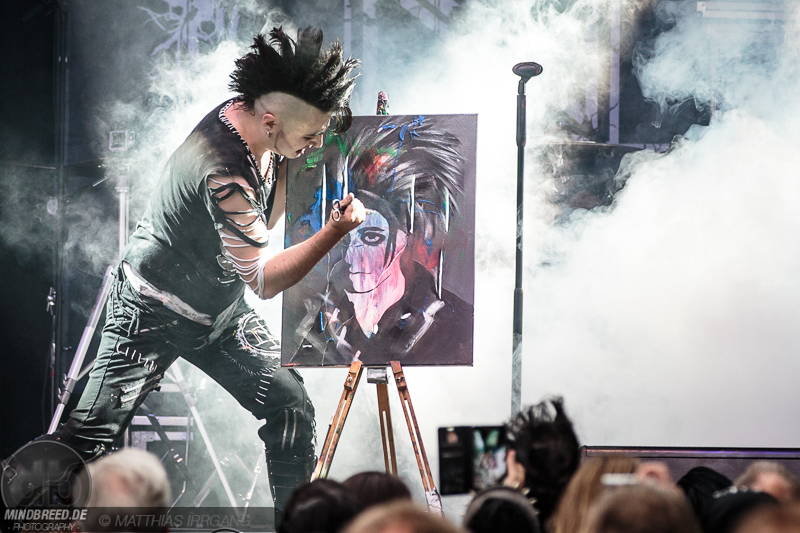 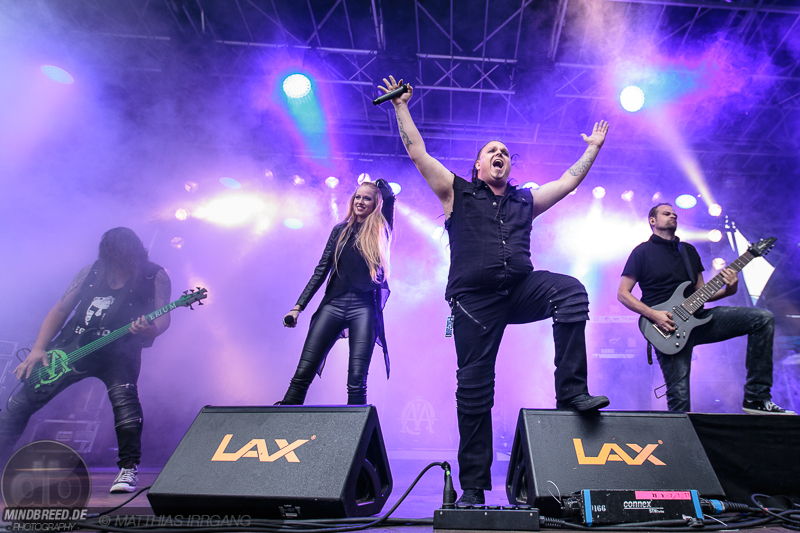 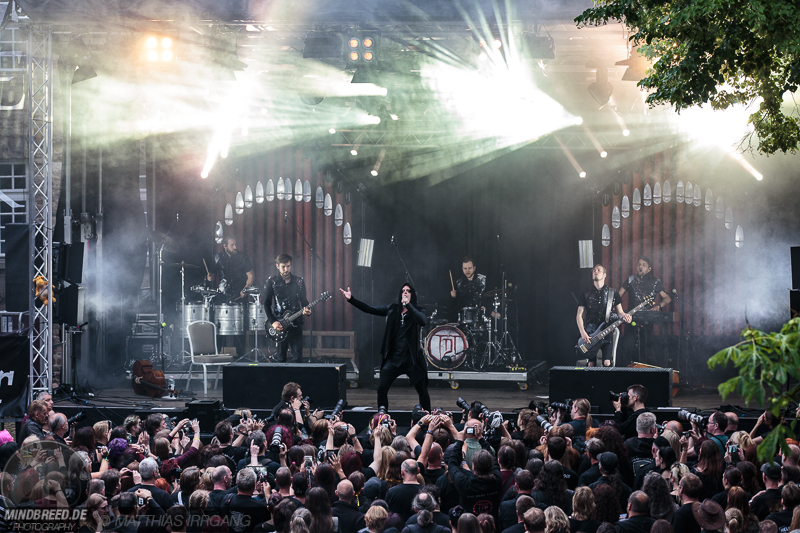 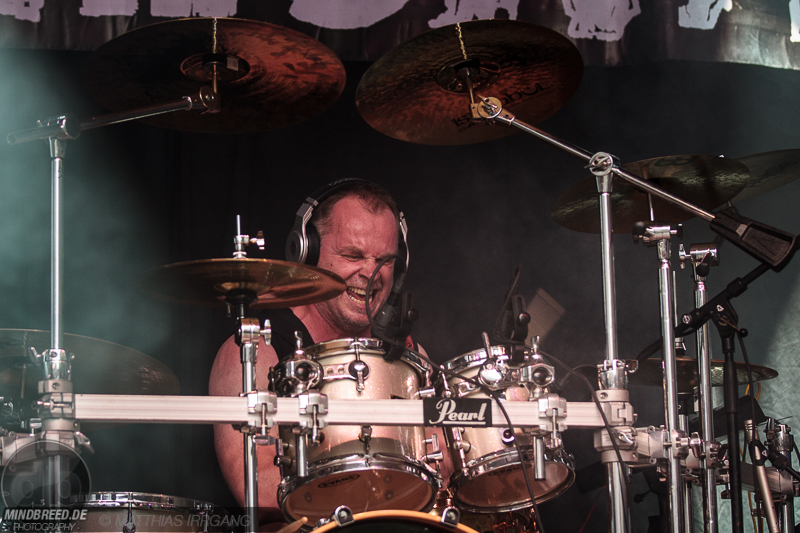 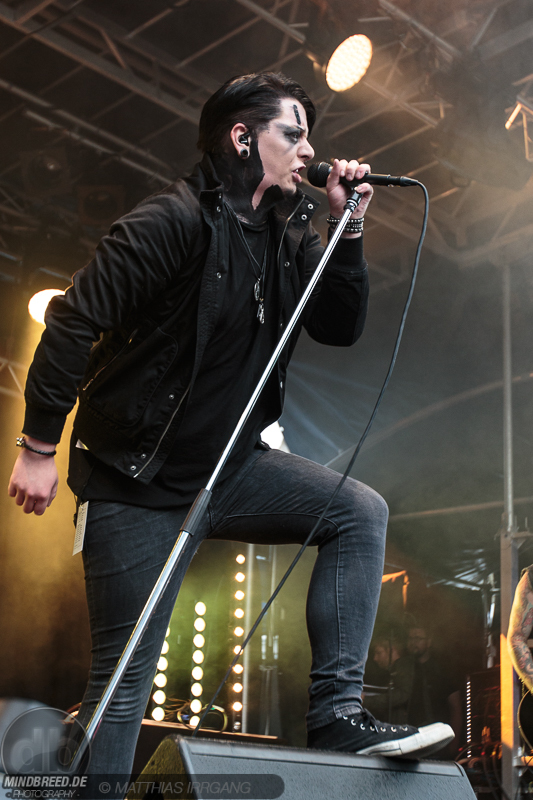 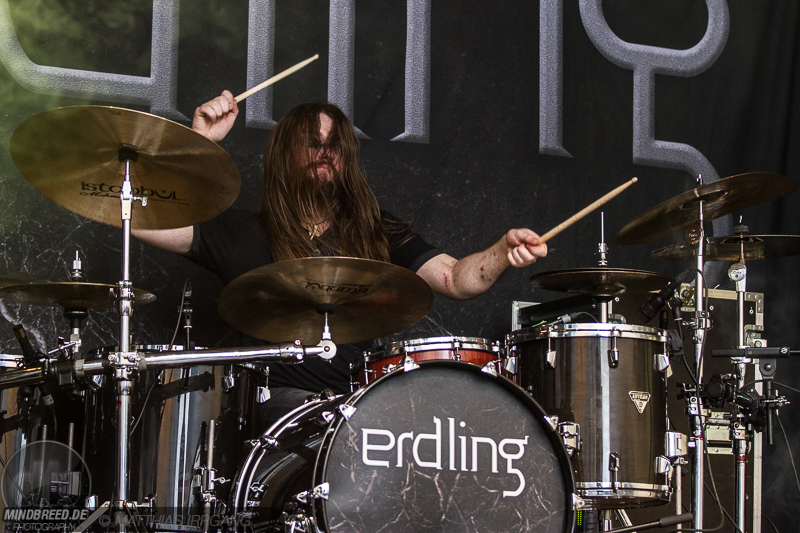 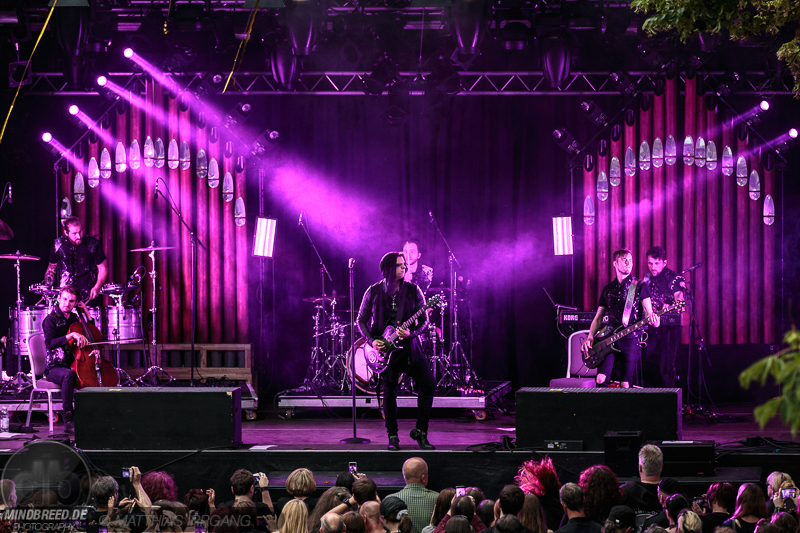 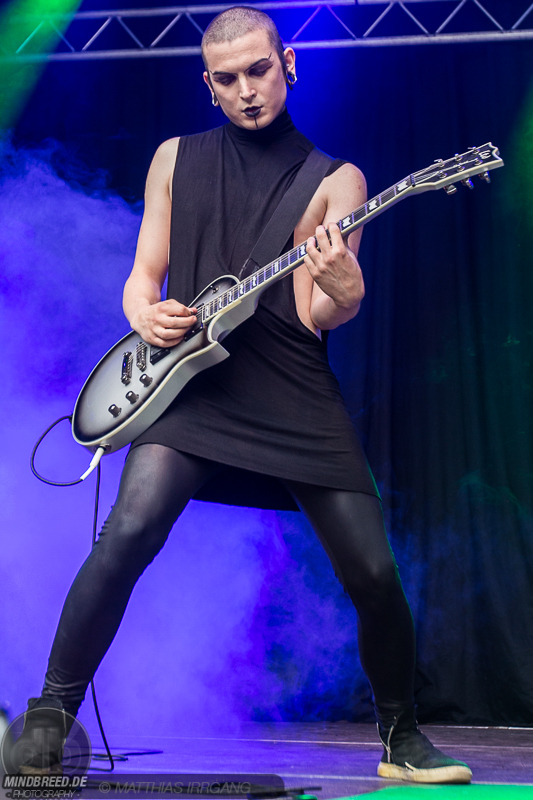 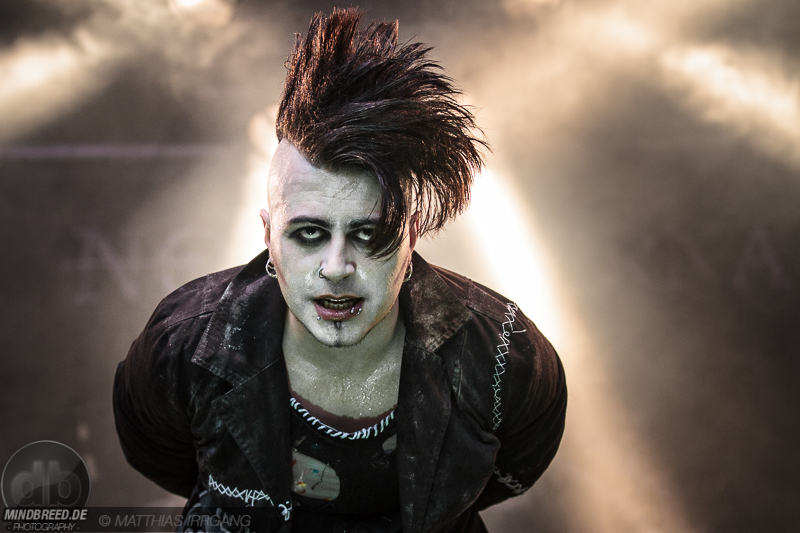 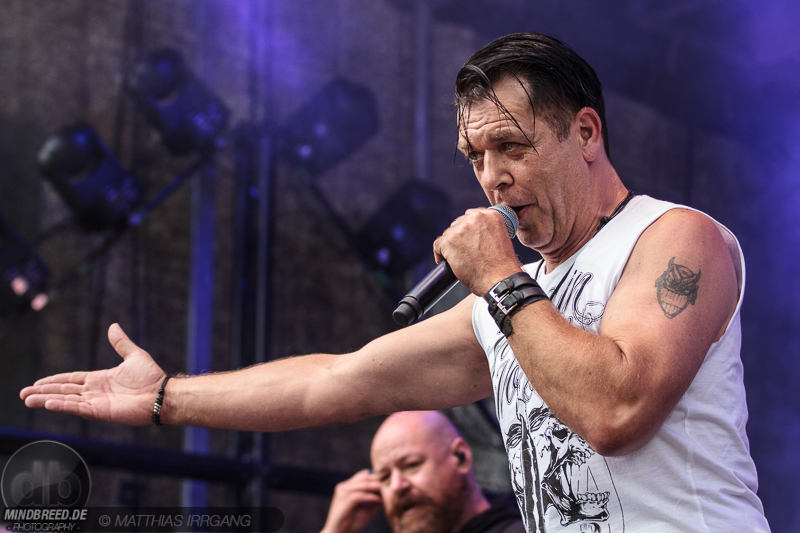 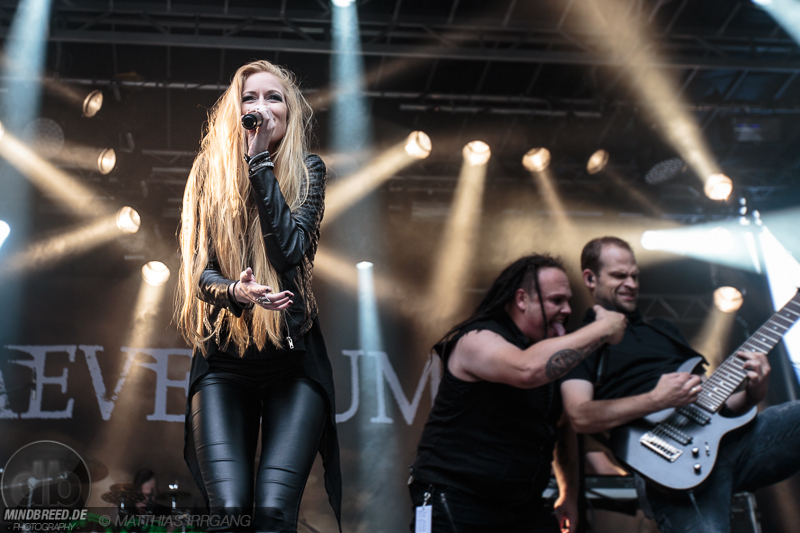 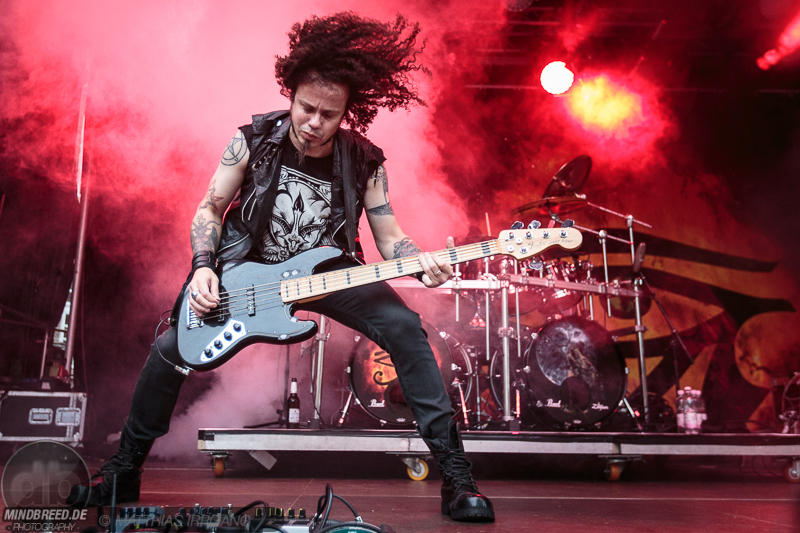 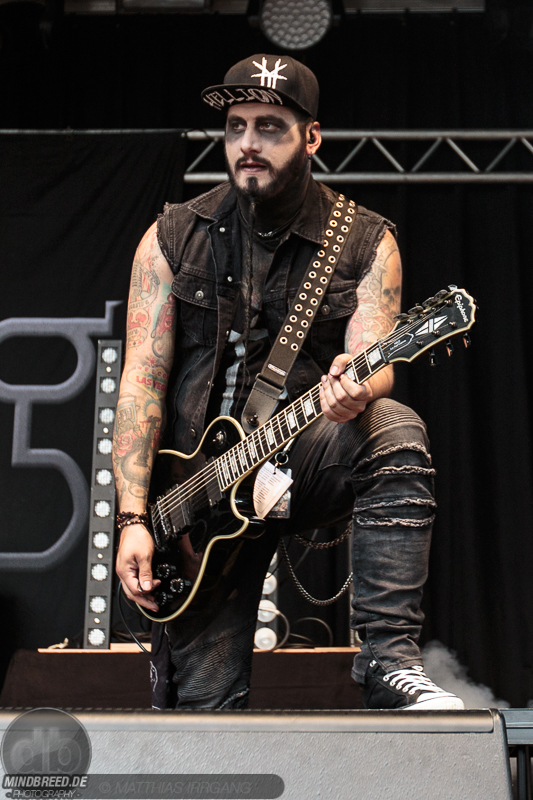 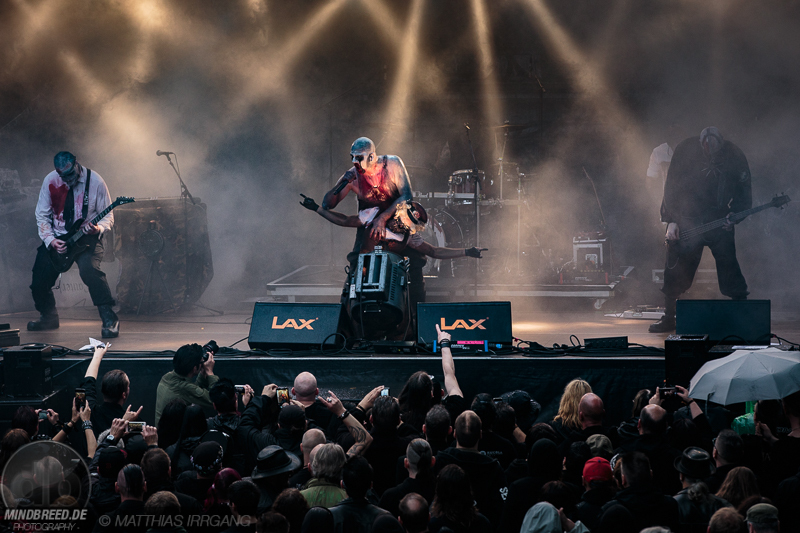 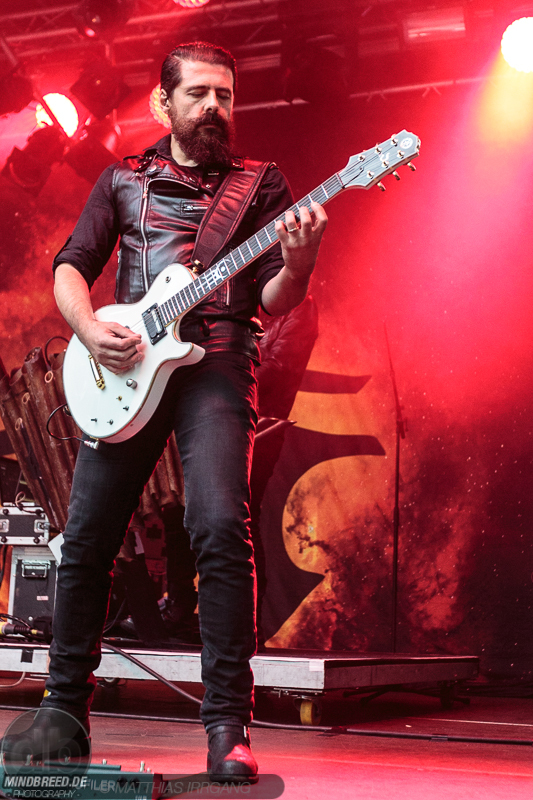 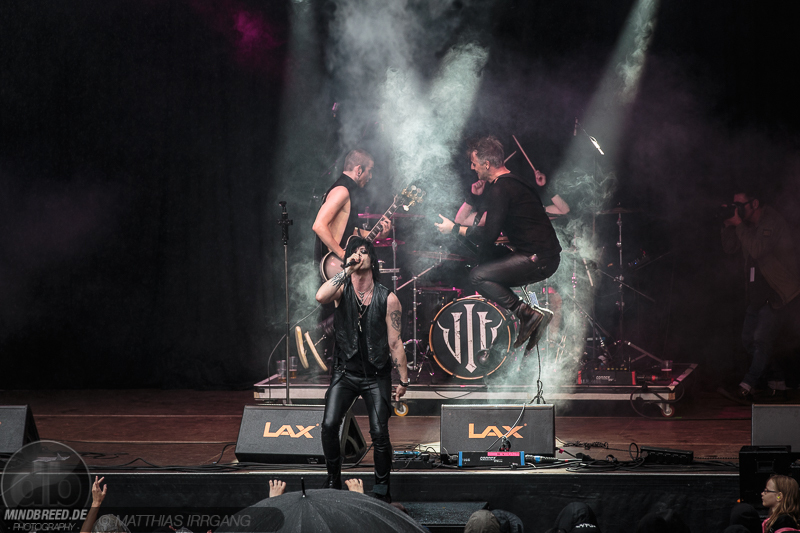 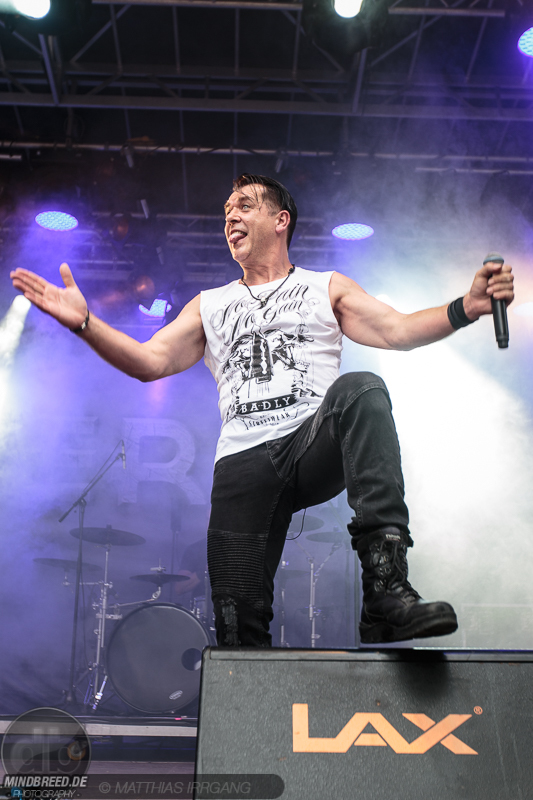 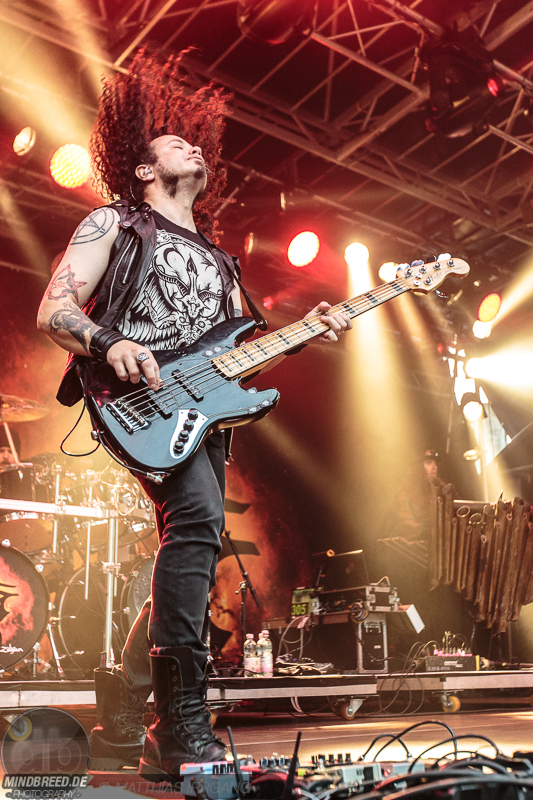 Alternative Metal in the style of “The Beauty and the Beast” was brought to the audience of the Castle Rock Festival with epic sounds not only to dance, they also caused the castle to tremble. 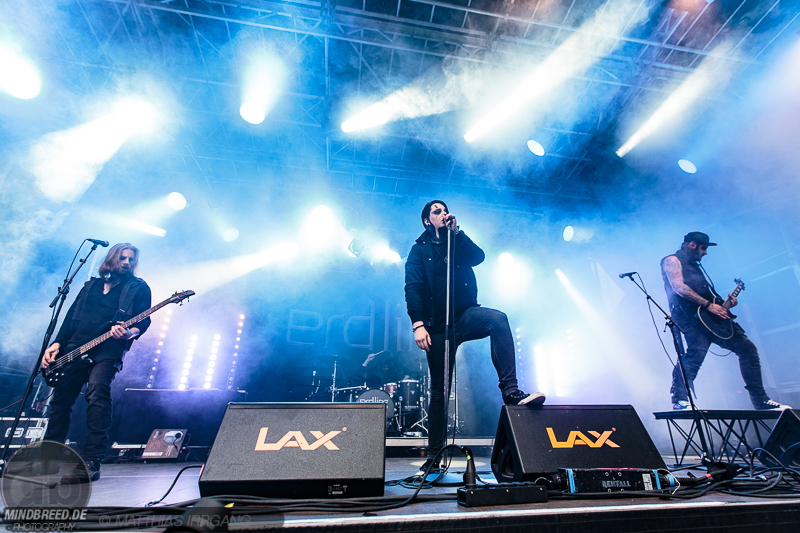 Musically in a completely different direction, we went on with the next act of the day. 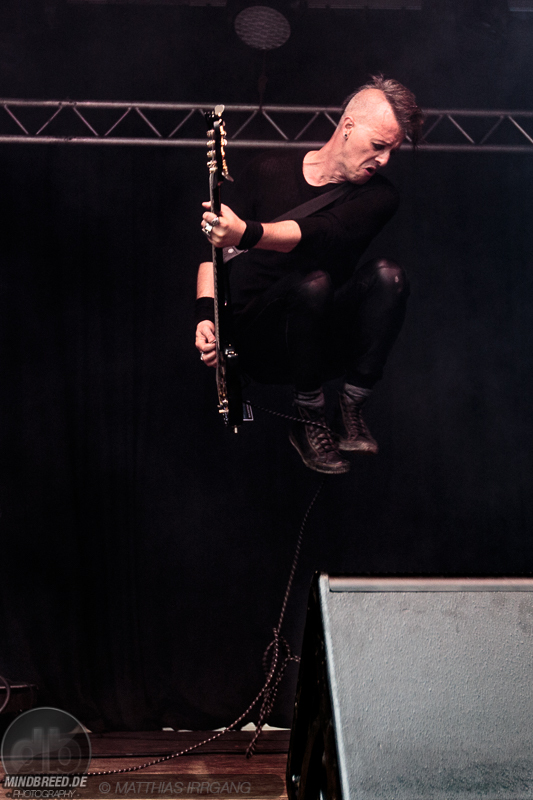 OST+FRONT know how to polarize and that is exactly their trademark. 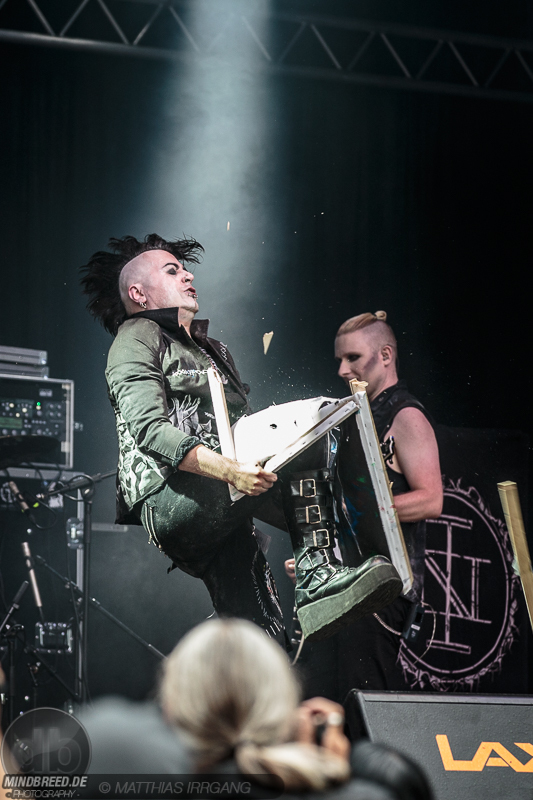 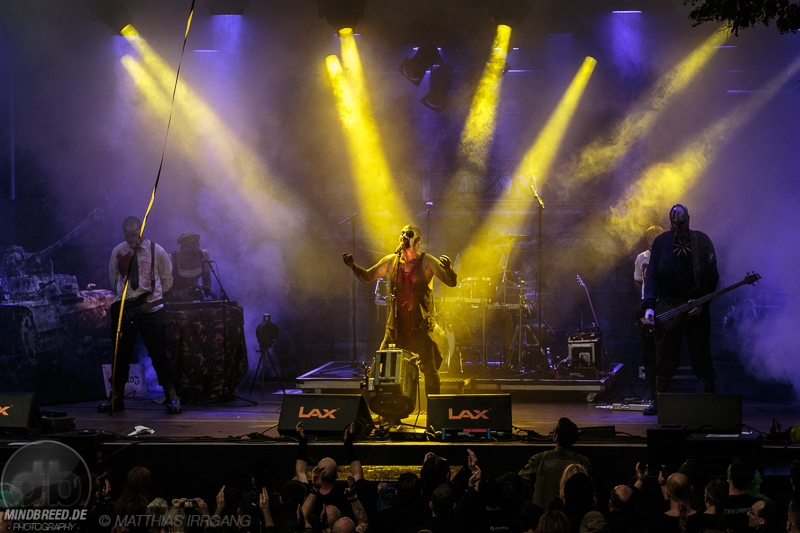 Neue Deutsche Härte in the unmistakable style of RAMMSTEIN is combined with rock and metal- an emerging mixture that is very well received by the audience. 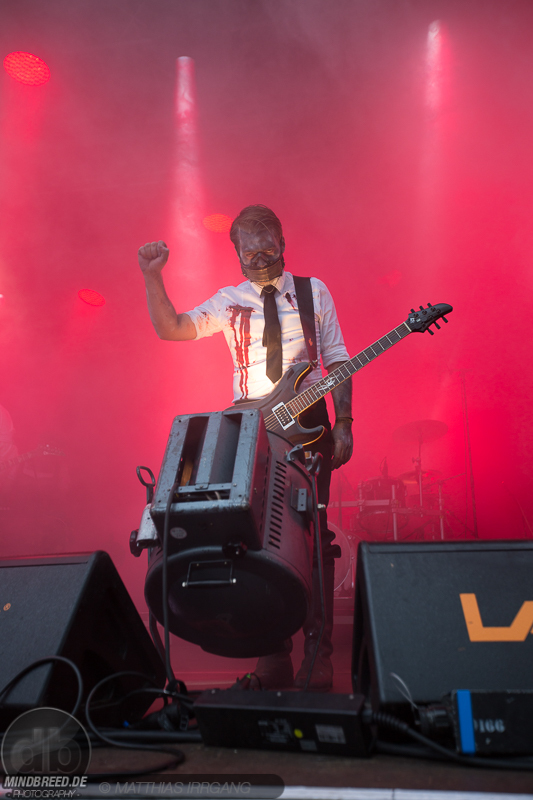 With their provocative outfits and the brutal sound, Castle Broich was definitely demolished with the help of the audience this evening. 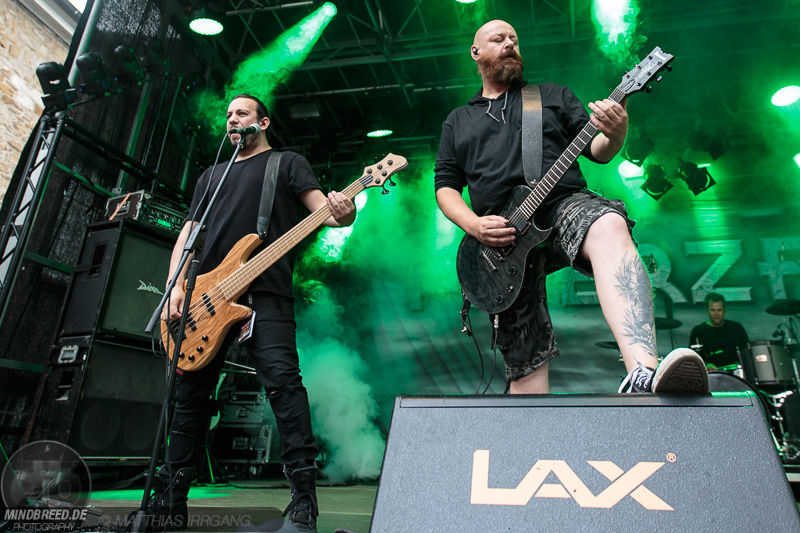 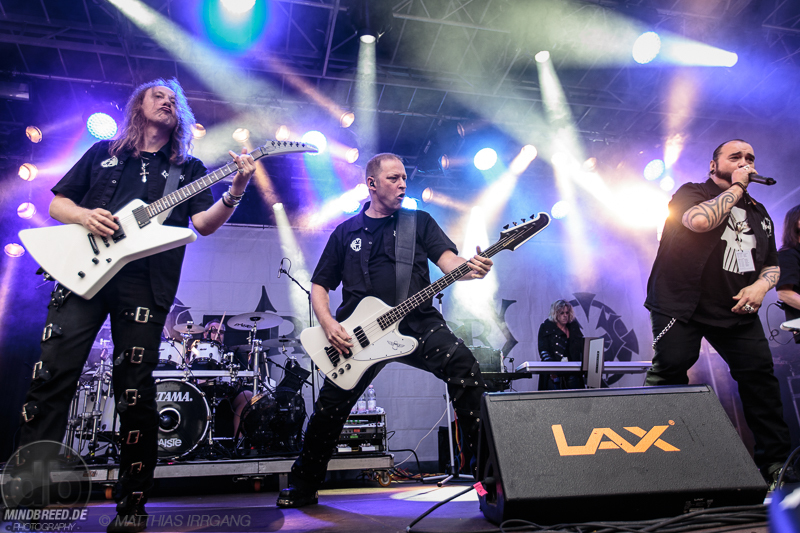 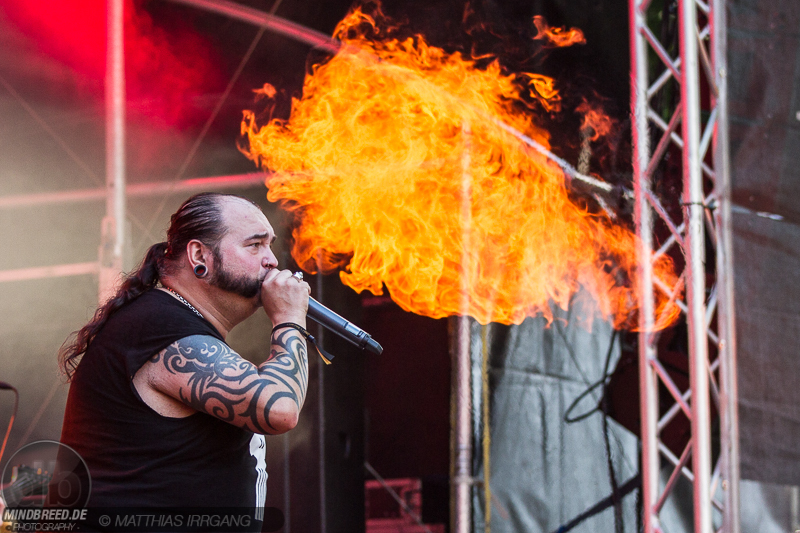 The legendary German Goth Metal band CREMATORY, which was the co-headliner of the evening, was starting next. 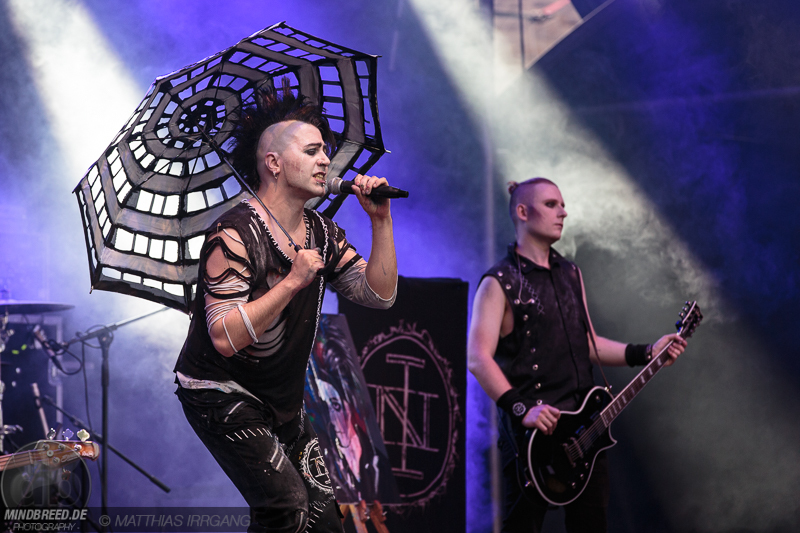 The rain gave way to a little sunshine and visitors could spend the rest of the evening without their umbrellas. 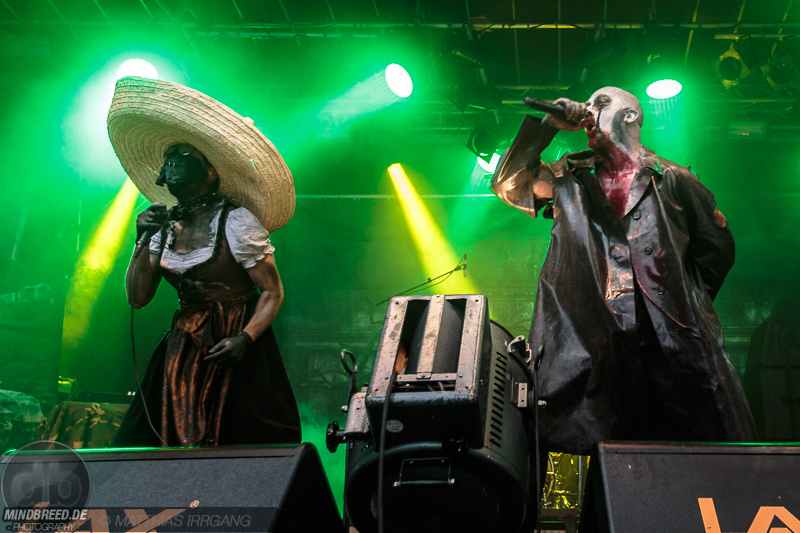 The band was able to capture the audience with their gloomy sounds and did not let them go until the end of their performance. 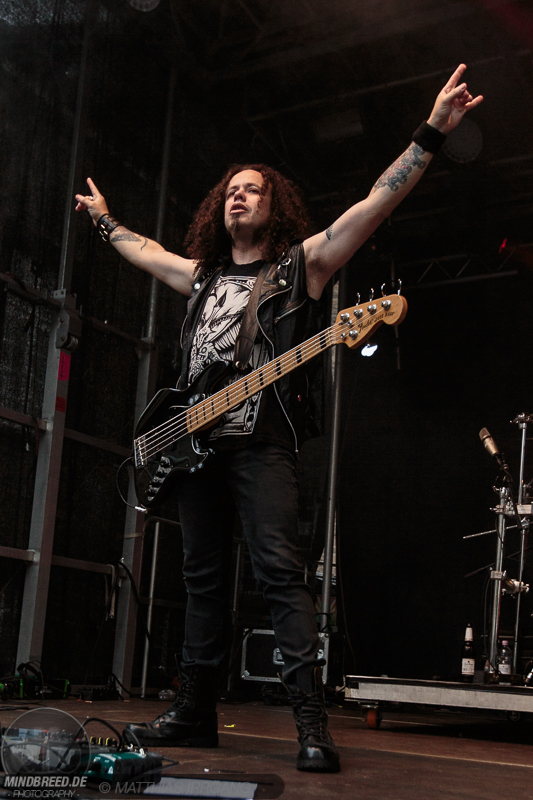 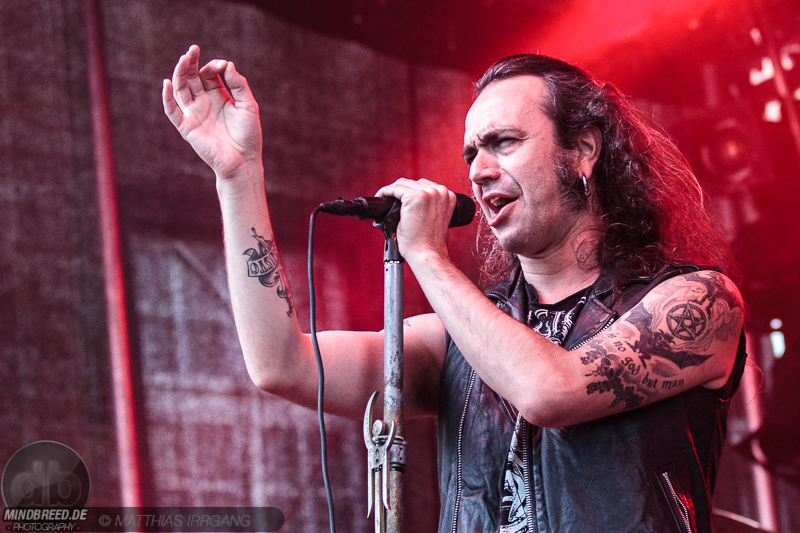 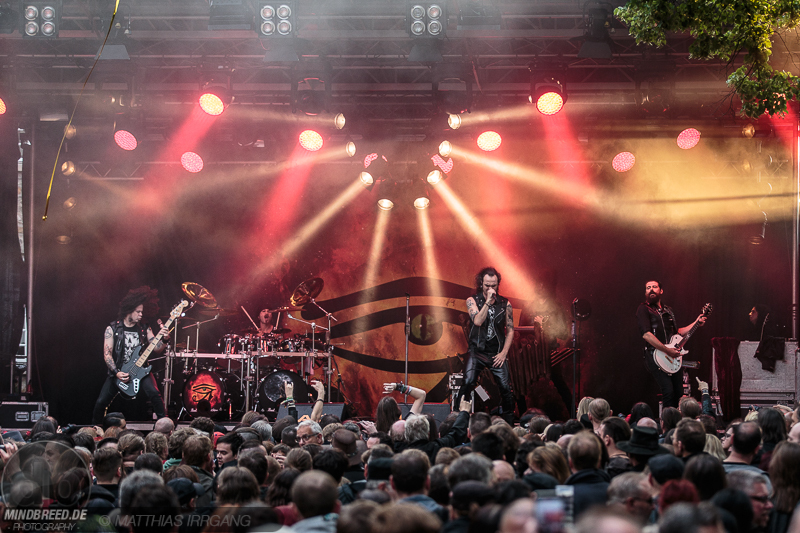 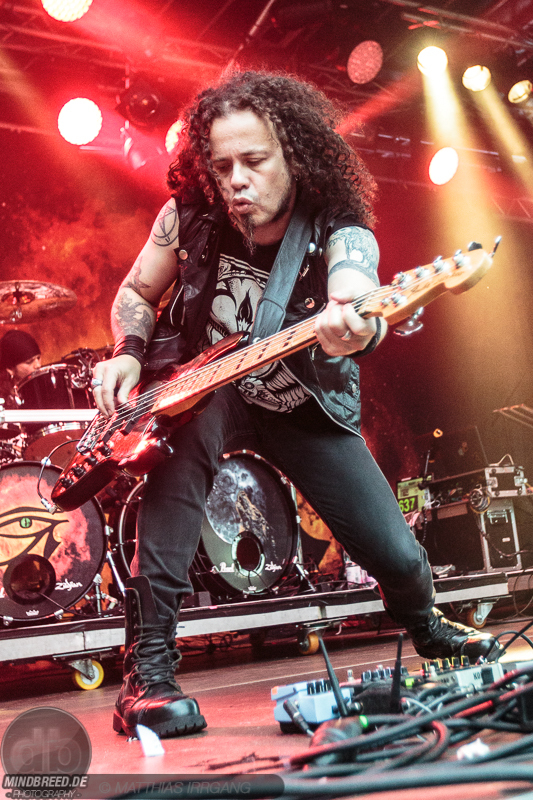 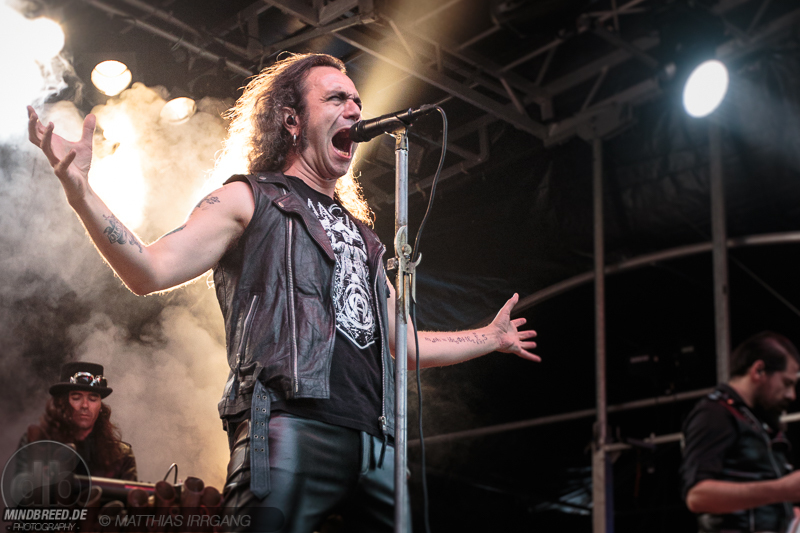 The next and final act of the Castle Rock 2017 was MOONSPELL. 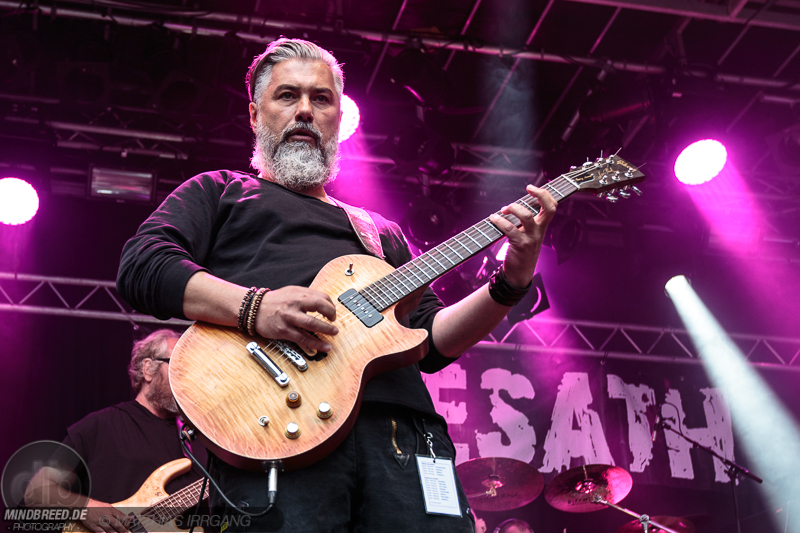 After changeover and a very long sound check, the Portuguese started as the last band of the evening. 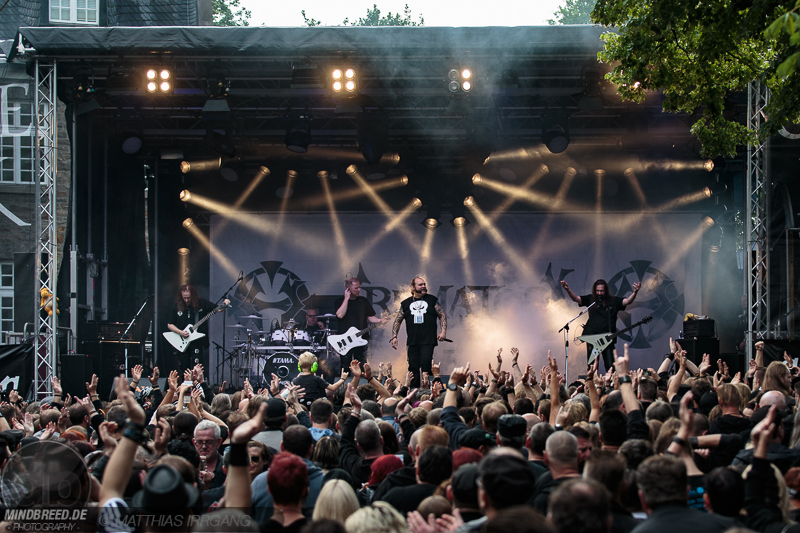 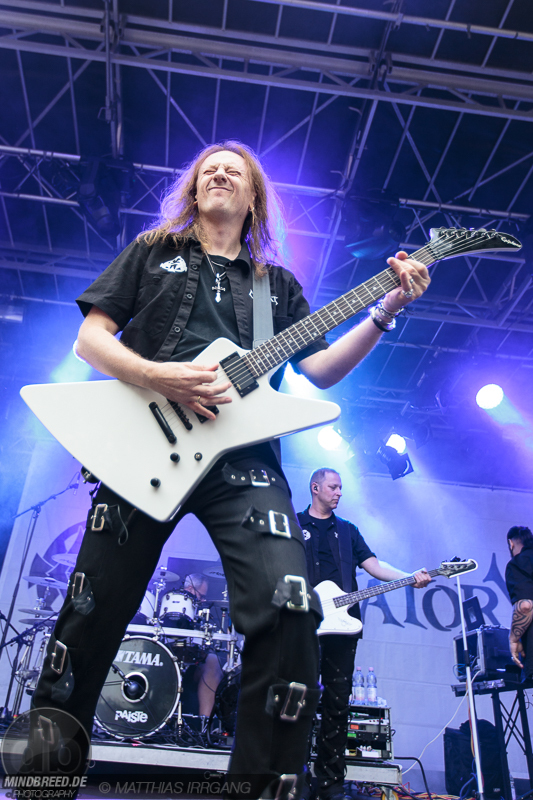 Melodic metal and a mixture of old and new songs finally brought a good mood among the guests and the festival to a great ending. 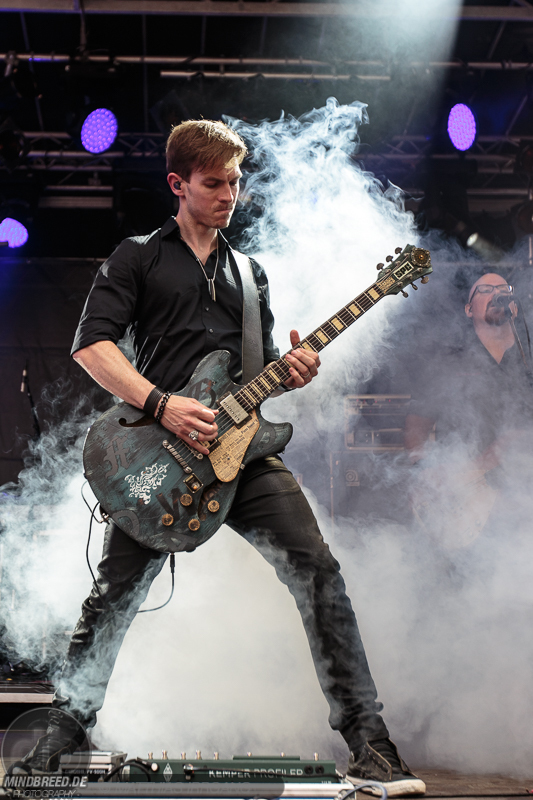 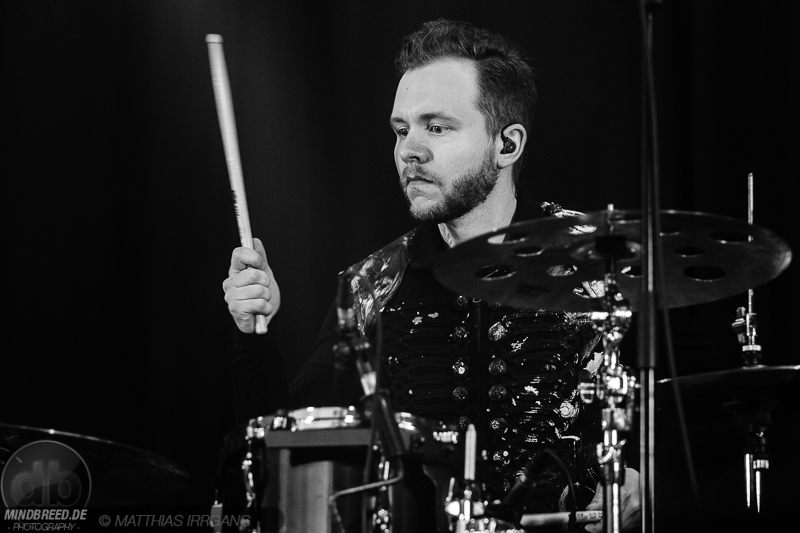 Michael Bohnes, the organizer of this small but fine festival, has once again managed to create a great weekend for the guests of the 18th Castle Rock, in a homely atmosphere, with good and varied music!